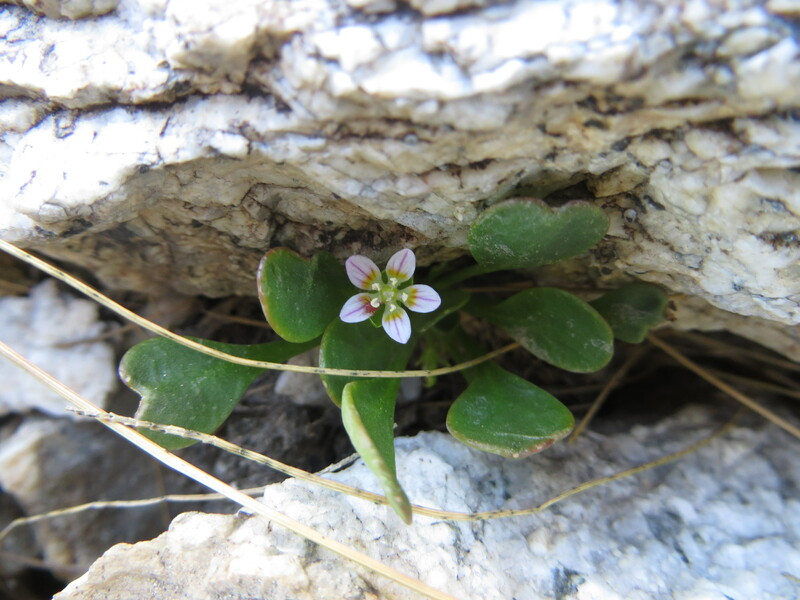 Claytonia.org | what is a species in this group anyway? 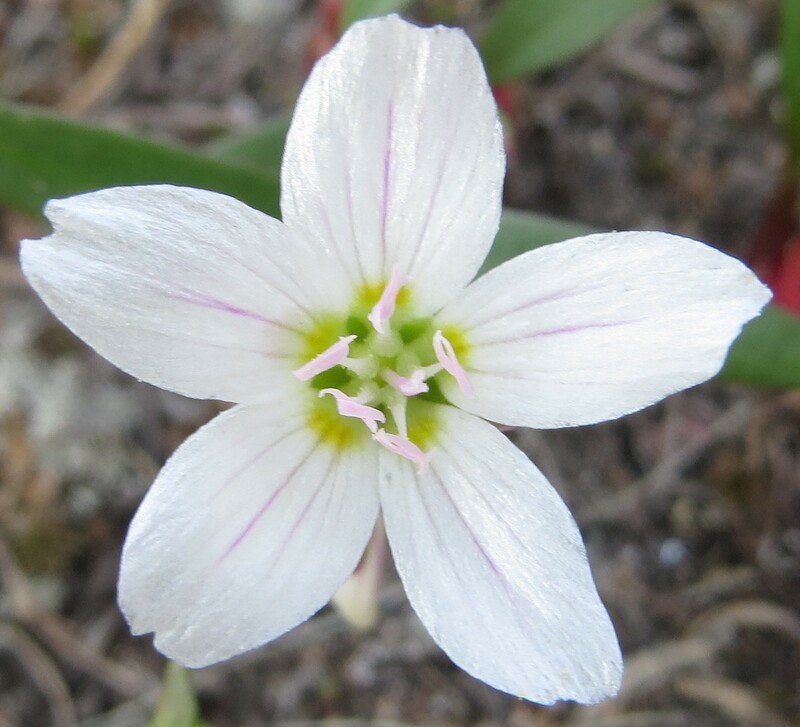 Hi, all — I’ve decided to switch things up and simply chat with you a bit about a topic that has apparently been the most popular on my blog so far: Claytonia rubra (Howell) Tidestrom. 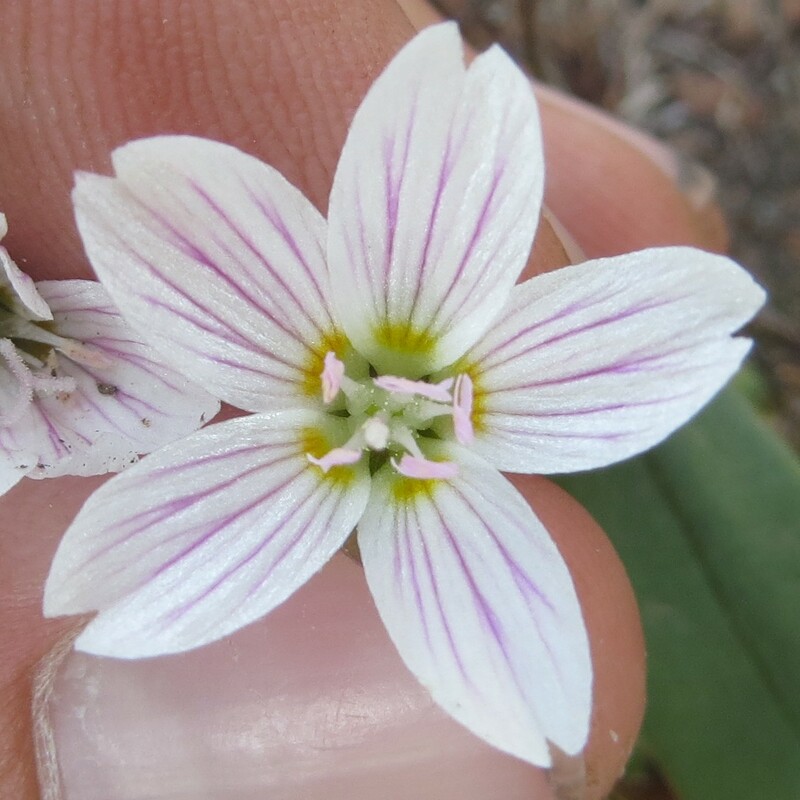 You may find yourself now asking the question, “Claytonia rubra, what is that?” Well, there’s a blog post for that. 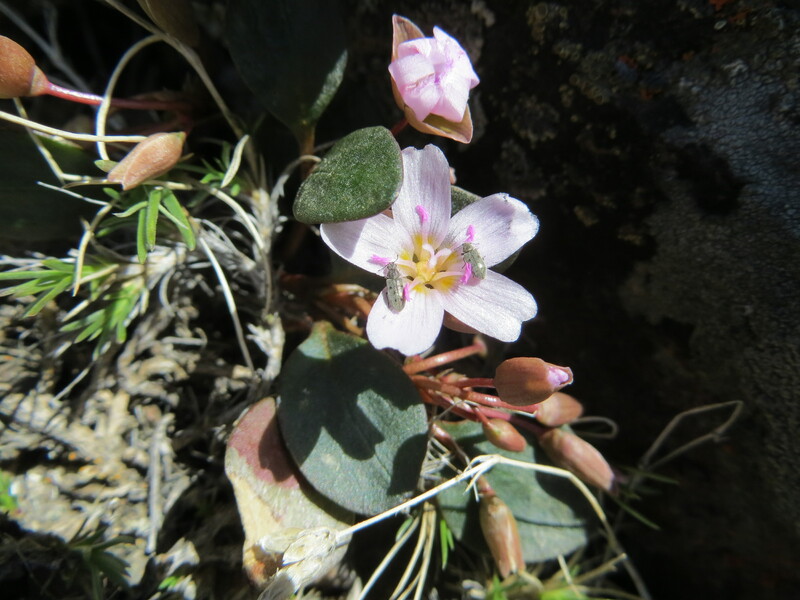 Claytonia rubra photographed while flowering, plants growing abundantly in the Pinyon-Juniper belt on the Modoc Plateau, northern California. 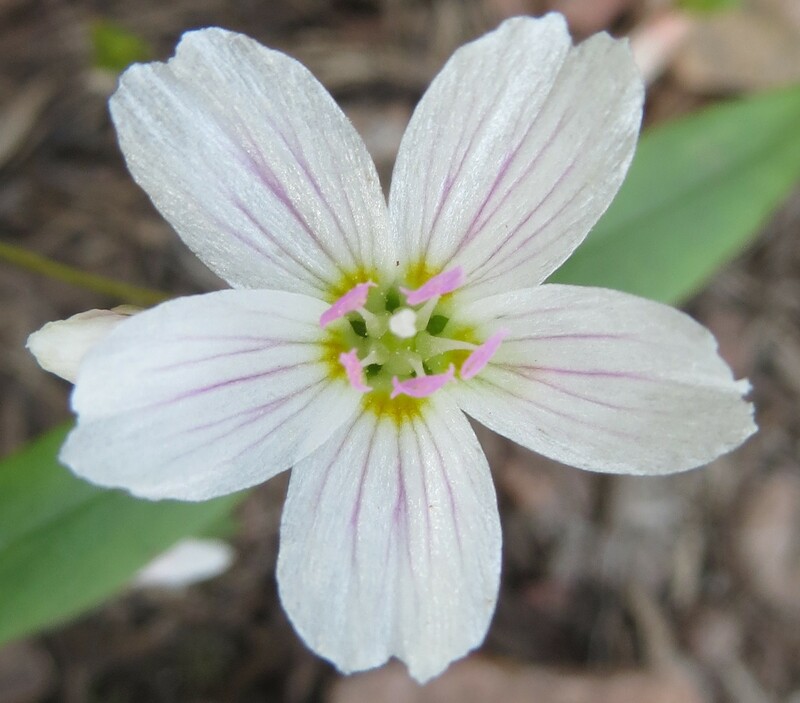 But Claytonia rubra may be more than meets the eye, especially if you’ve been paying close attention to it where it grows in different areas, or if you’ve been so lucky as to see it from across its entire geospatial distribution. 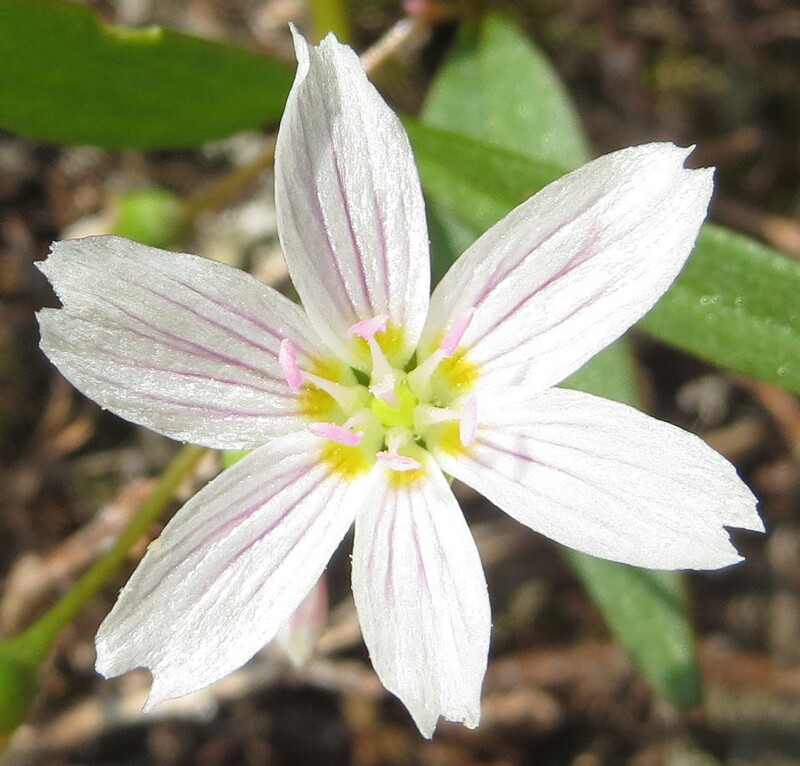 Let’s think about this for a minute, considering first the global range of Claytonia rubra. Range map from Flora of North America Treatment by Miller and Chambers (2003). 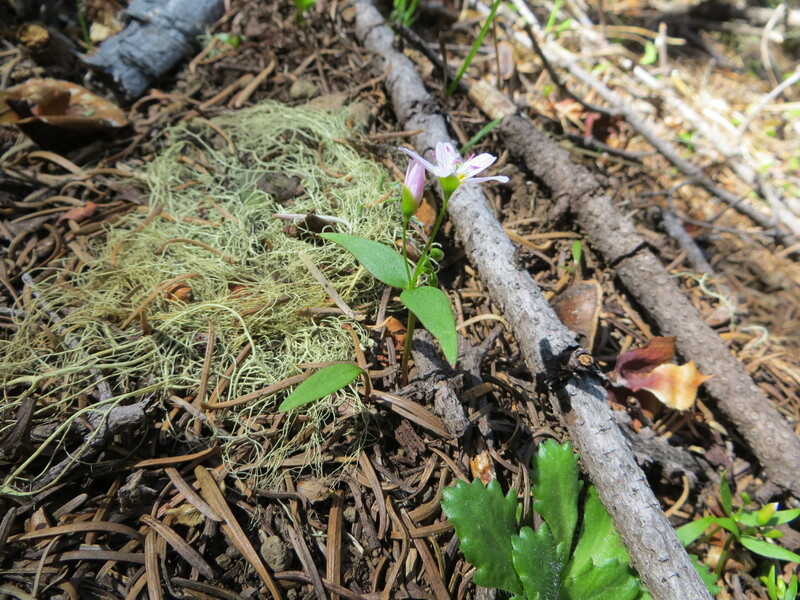 It is across this wide and ecologically diverse distribution, north to south from British Columbia to near (probably in) Mexico, and west to east from the San Francisco Bay Area to the Black Hills of South Dakota, that the annual Claytonia rubra displays a seriously diverse range of morphologies. 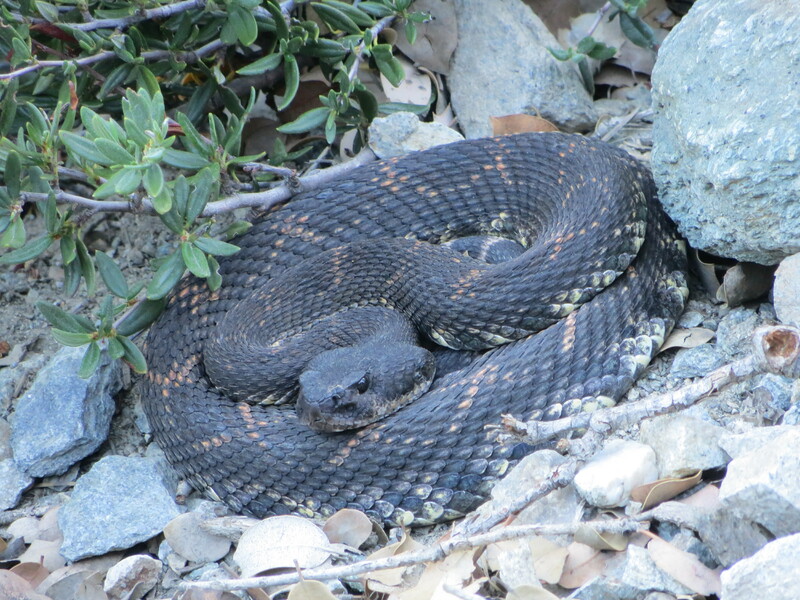 Is it phenotypic plasticity? 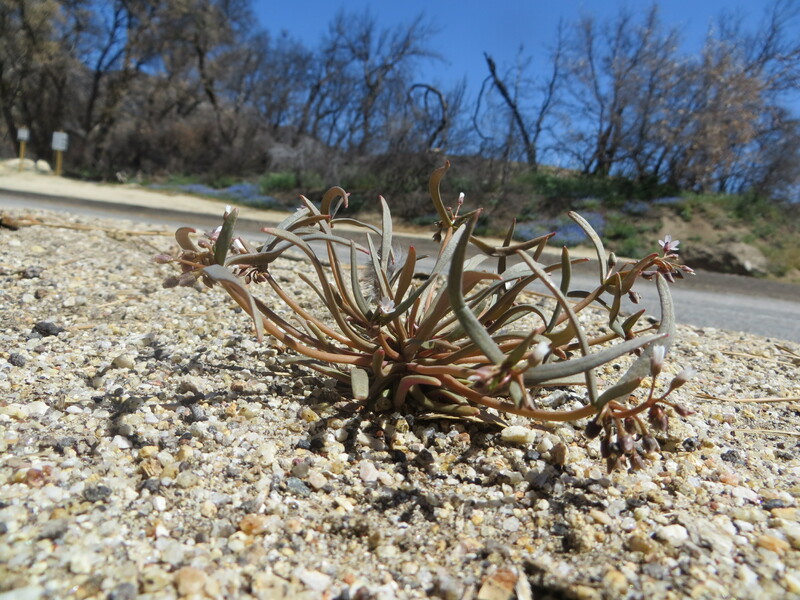 Is it local adaptation? 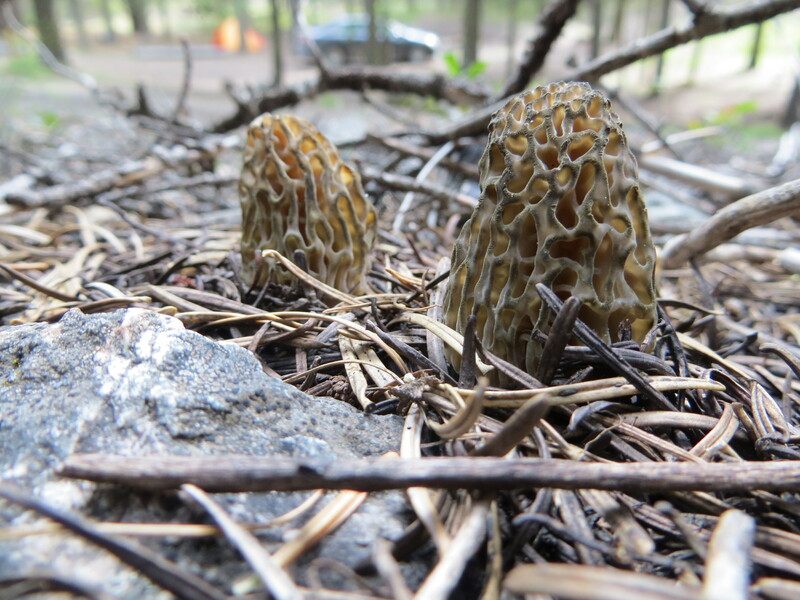 Is it speciation? 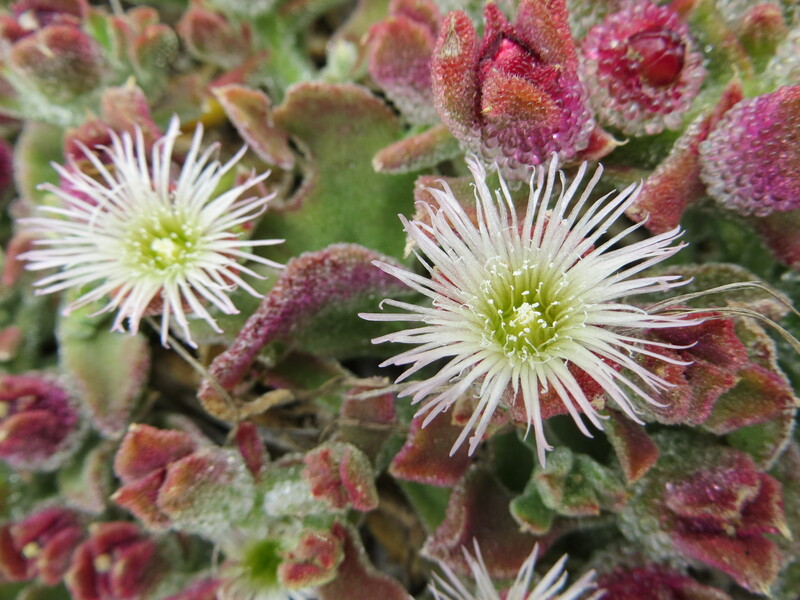 Is it hybridization? Is it some mix of all of these? 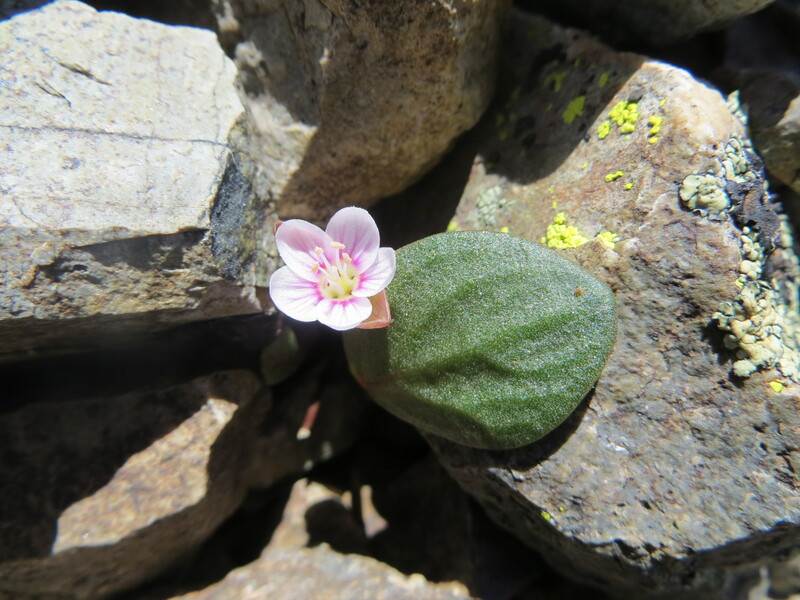 Claytonia rubra is a tough cookie to crack! 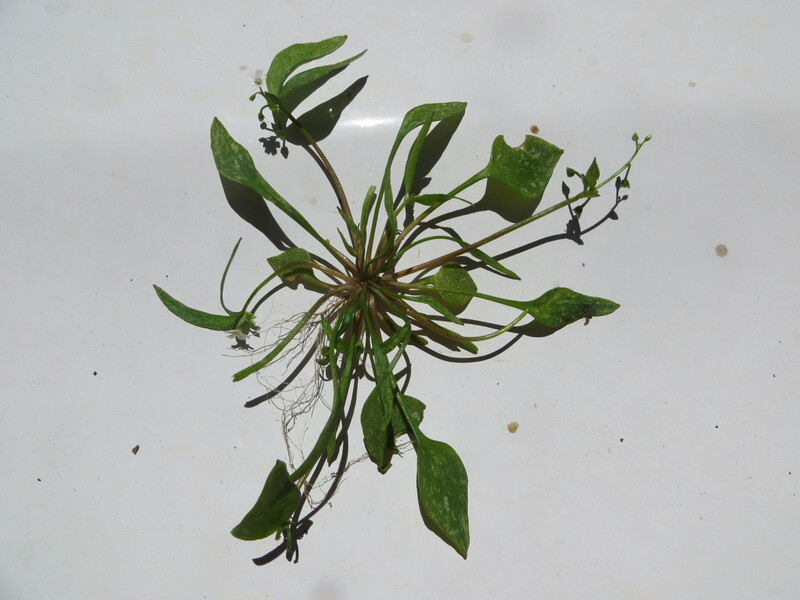 Starting with identification, something I’ve found to be fairly characteristic of Claytonia rubra is that its older leaves (outermost in the rosette of basal leaves), which often have the largest blades, tend to lay flat on the ground — some close relatives (like certain subspecies of C. perfoliata) do this too, or something like it, so don’t take this for a smoking gun. 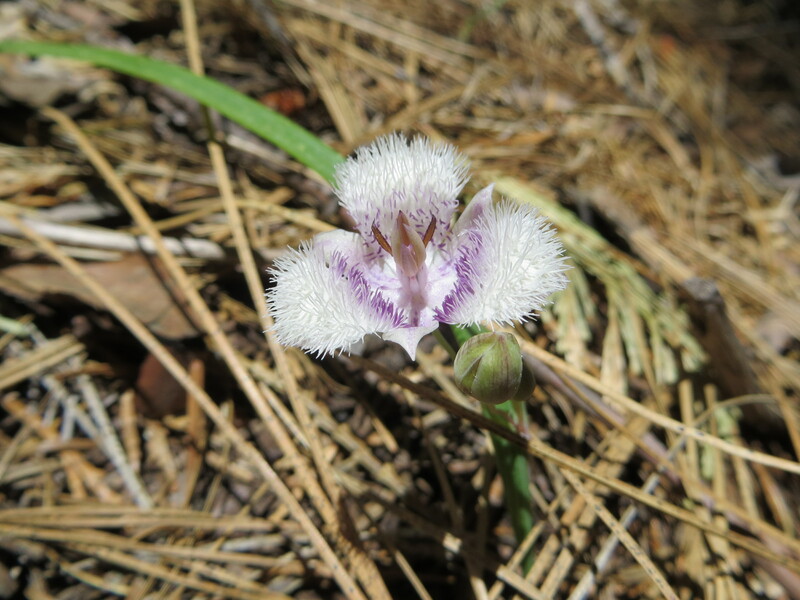 Furthermore, some races of C. rubra do not have basal rosettes that lay flat, rather they are elevated ever so slightly above the forest floor. Don’t you just love those kinds of dichotomous key breaks? 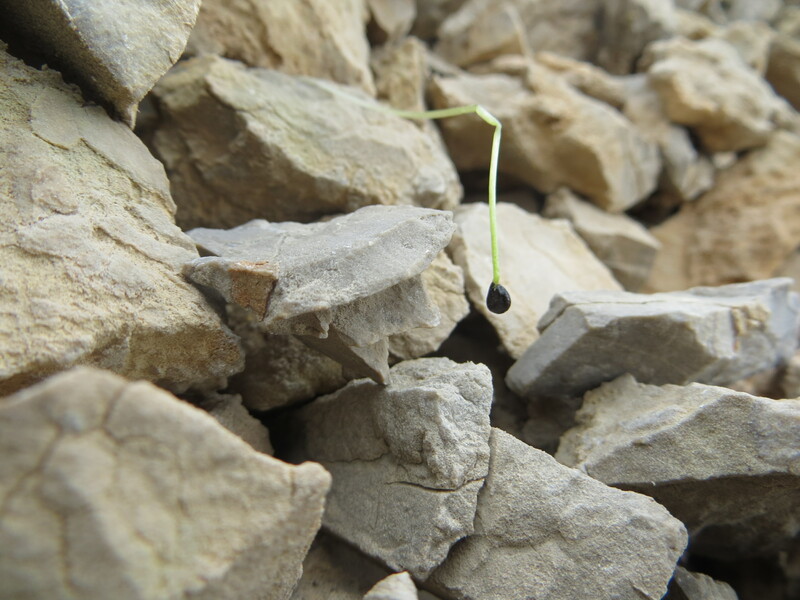 — Is is erect to ascending (sometimes spreading), or ascending to spreading (sometimes erect)?! 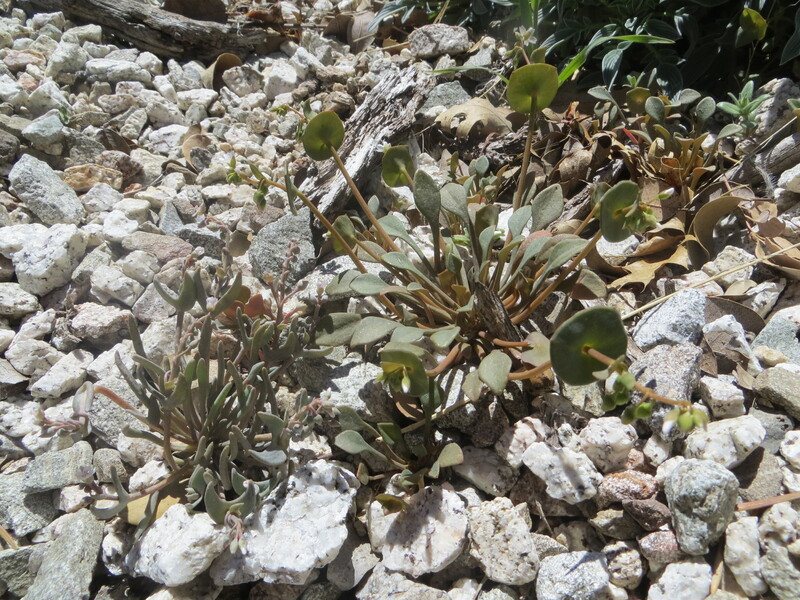 — Still, if you see something in the mountains of western North America like in the picture below, where the outermost (older) leaves in the basal rosette lay flat, appressed to the ground, you can be fairly confident that you are looking at something that is quite appropriately called Claytonia rubra. 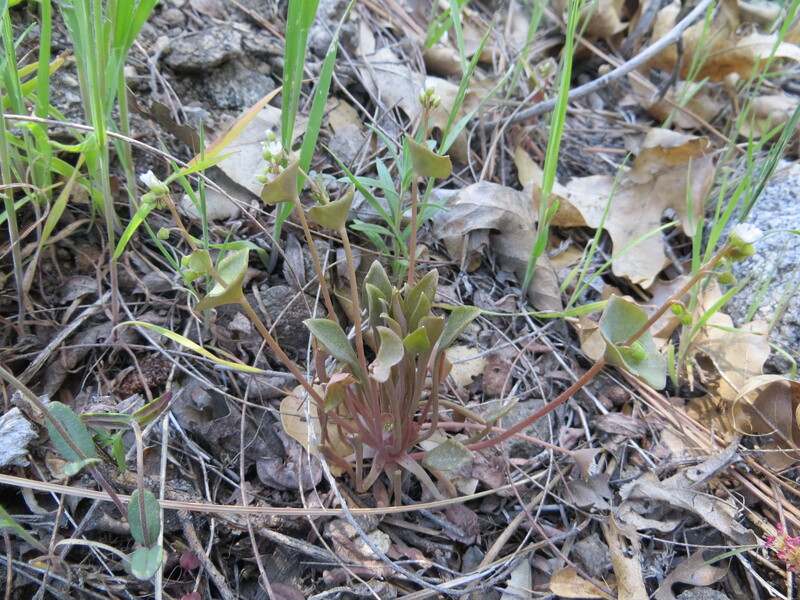 Vegetative Claytonia rubra photographed at the Tejon Ranch in the Tehachapi Mountains, southern California. 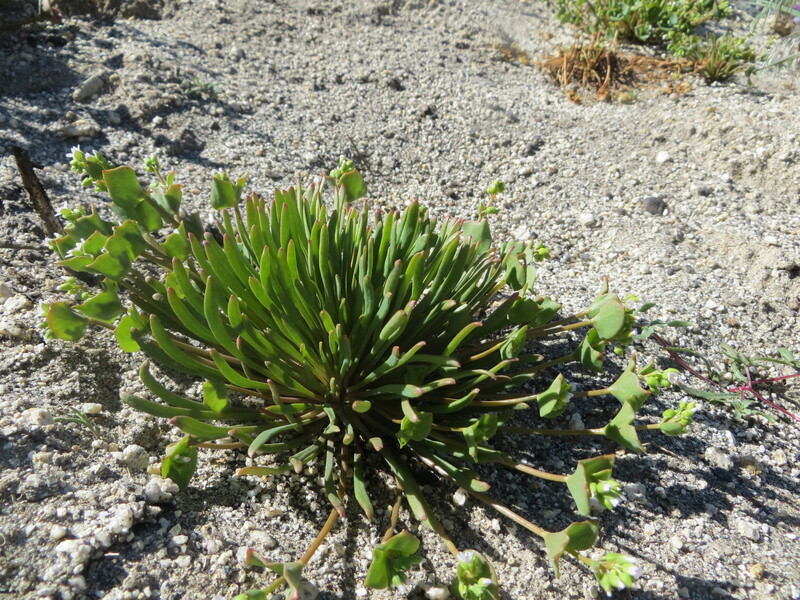 For effect, compare the leaves of Claytonia rubra plants in the above picture with the leaves of the plant in the picture immediately below, C. perfoliata, both of which were photographed at the Tejon Ranch in somewhat close proximity (either side of the same mountain ridge) — see how Claytonia perfoliata (below) tends to elevate its leaves off the ground? 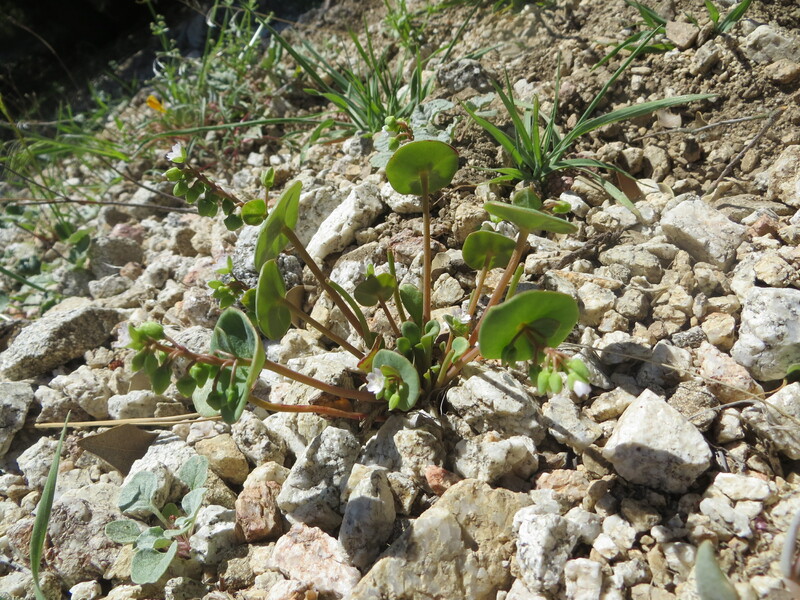 Vegetative Claytonia perfoliata photographed at the Tejon Ranch in the Tehachapi Mountains, southern California. 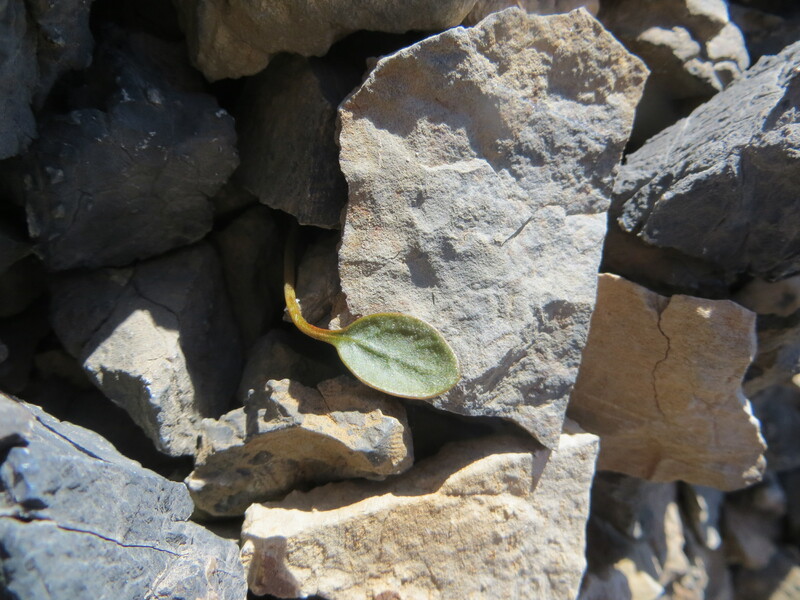 The characteristic of Claytonia rubra have low-growing leaves seems pretty useful, until you come across a putative lineage (sometimes in the same mountain range!) 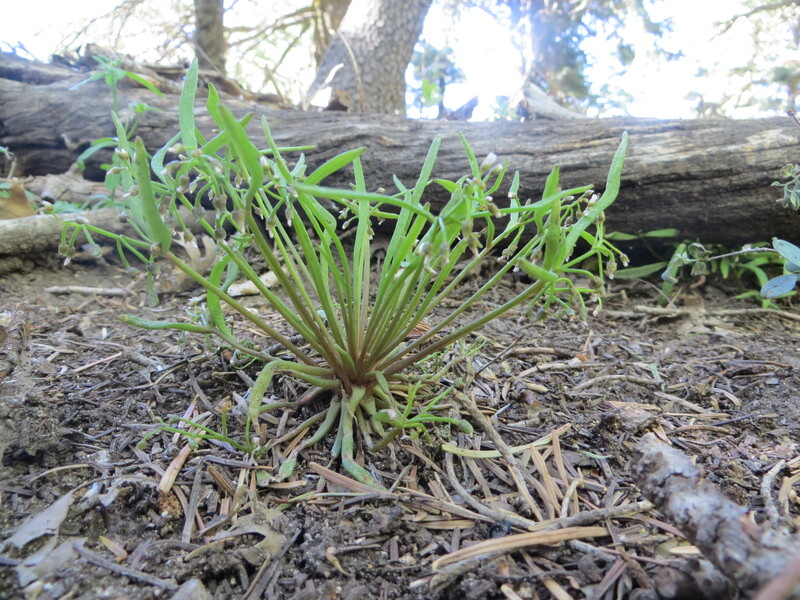 that looks like the plant below — these plants have distinctly erect / ascending leaves, although the proximal portion of their petioles are still appressed to the ground. 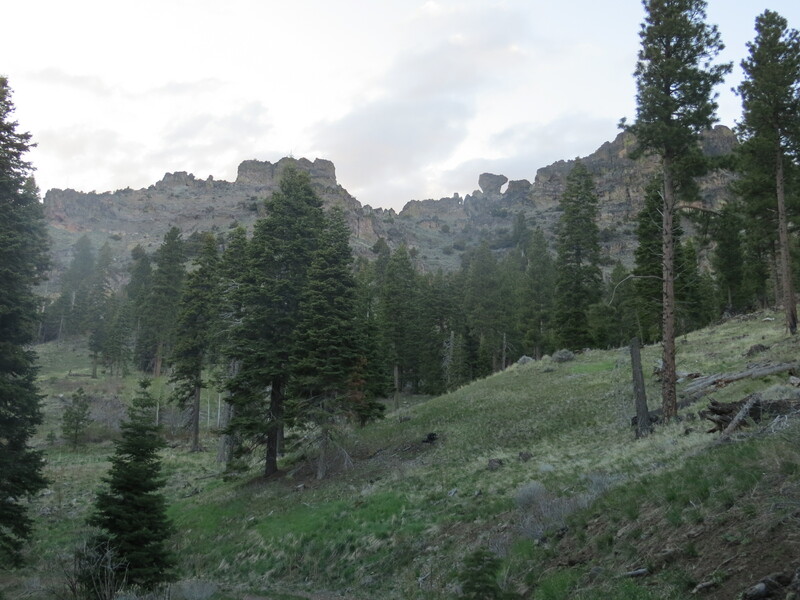 This gives the leaves a sort of ‘S-curved’ look. 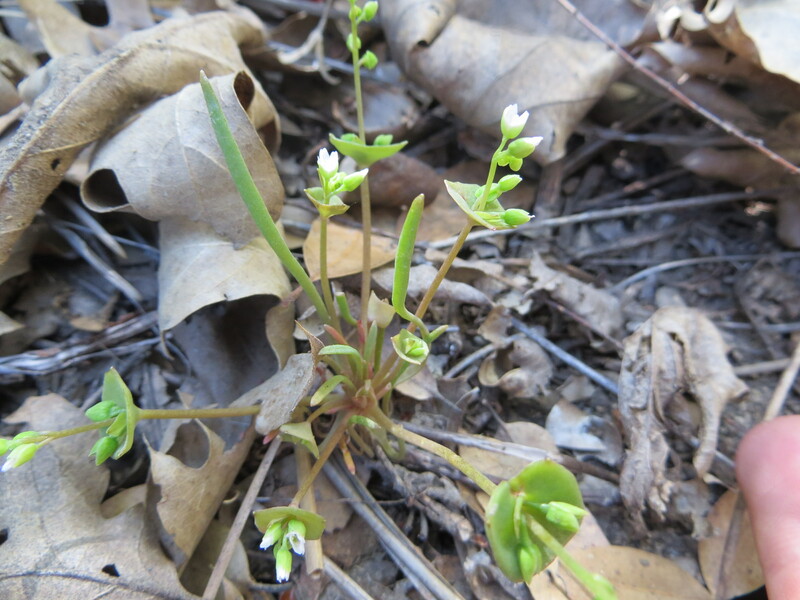 Believe it or not, these are another subspecies of Claytonia rubra! 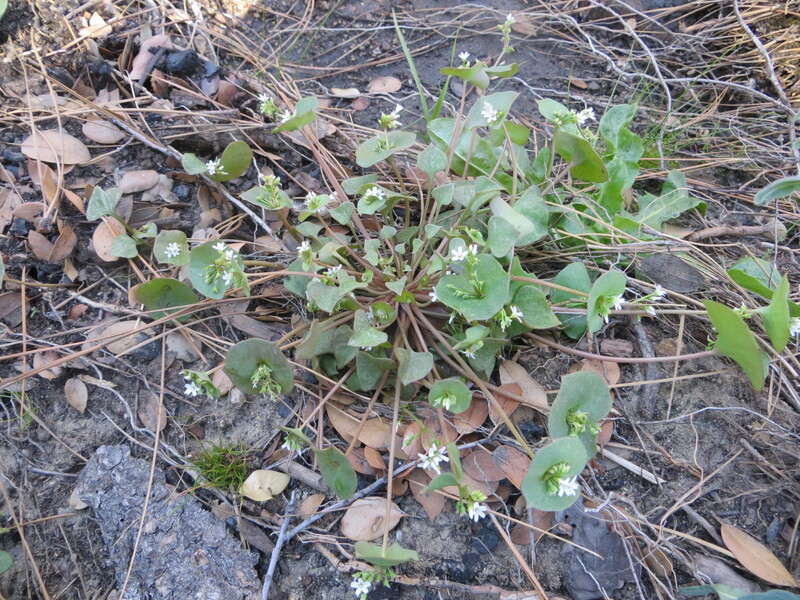 Claytonia rubra photographed while flowering at the Tejon Ranch in the Tehachapi Mountains, southern California. 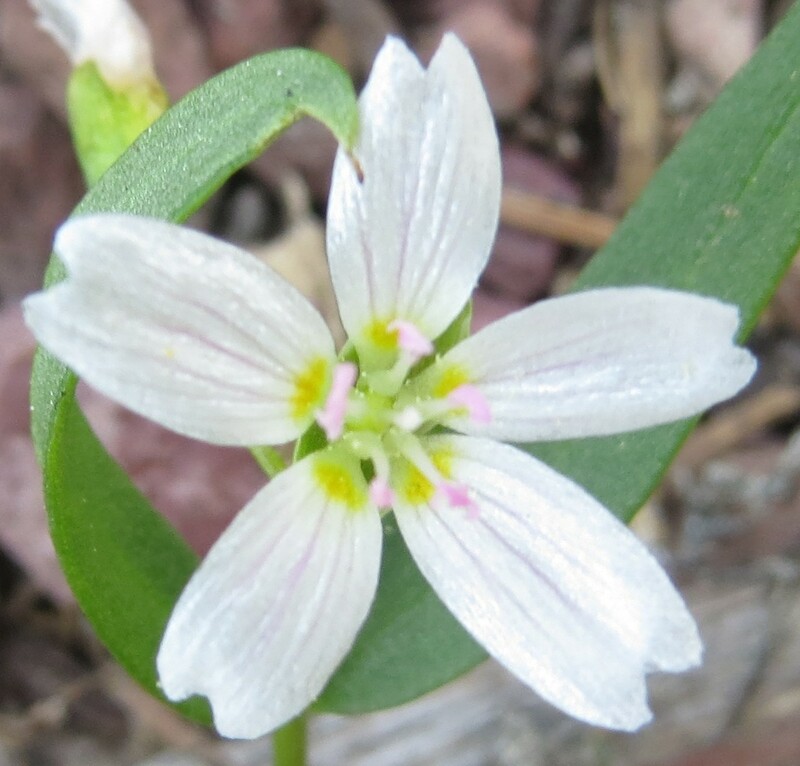 This is a time where it comes in handy to know a few other characters that, when used in combination, can help to distinguish Claytonia rubra from similar-looking miner’s lettuce. 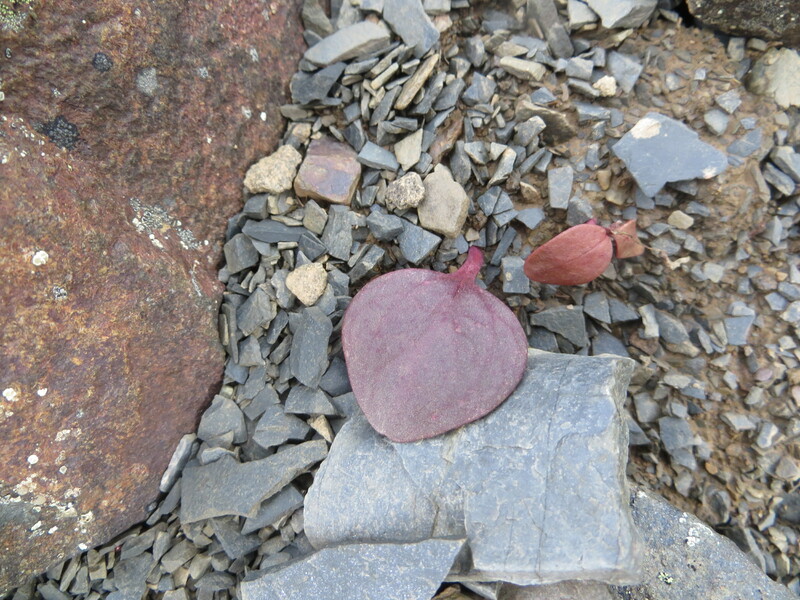 Classic, beet-colored (reddish to purplish) undersides of basal leaves of Claytonia rubra. 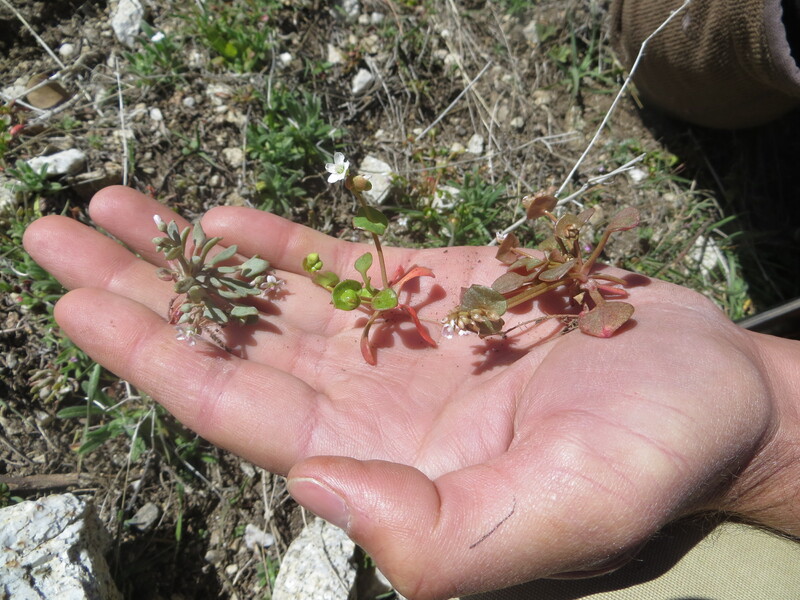 Whenever possible, try to observe this character in multiple plants — Generally, the basal leaves should be deep green adaxially and reddish abaxially in Claytonia rubra. 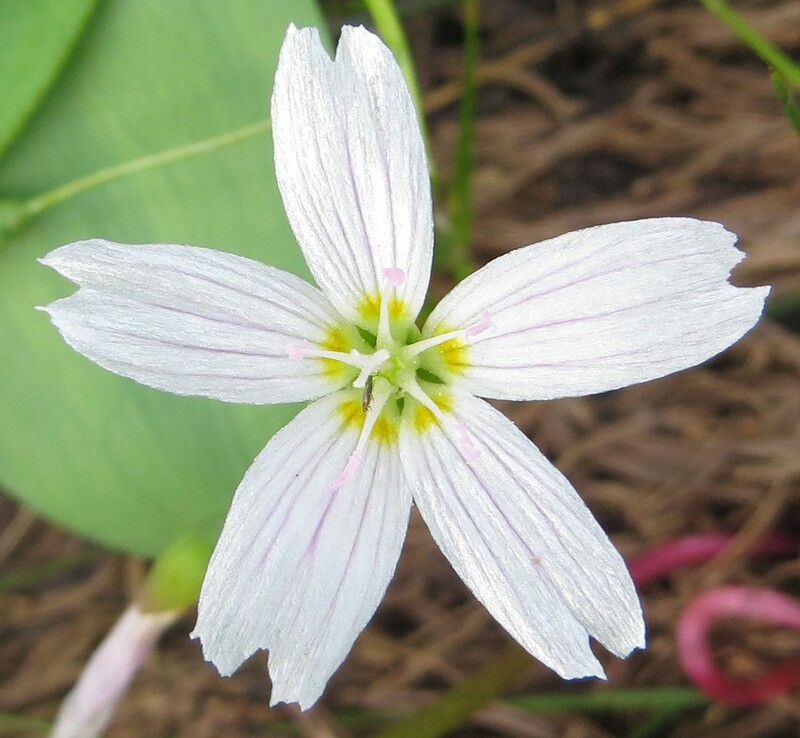 For example, the plants photographed above demonstrate another conspicuous characteristic of most lineages of Claytonia rubra — betalain pigmentation is generally evident on the abaxial (lower) surfaces of the basal (and sometimes cauline) leaves, giving them a purple/reddish appearance. 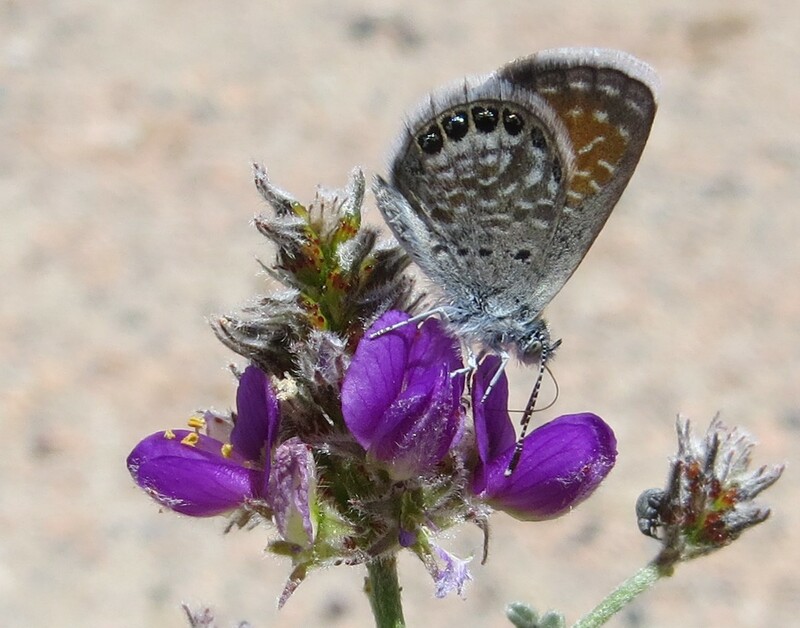 This is a sort of ‘no-brainer’ character I tend to point people towards, but just as with the characteristic basal leaf orientation I mentioned above, this morphological character doesn’t always hold true. 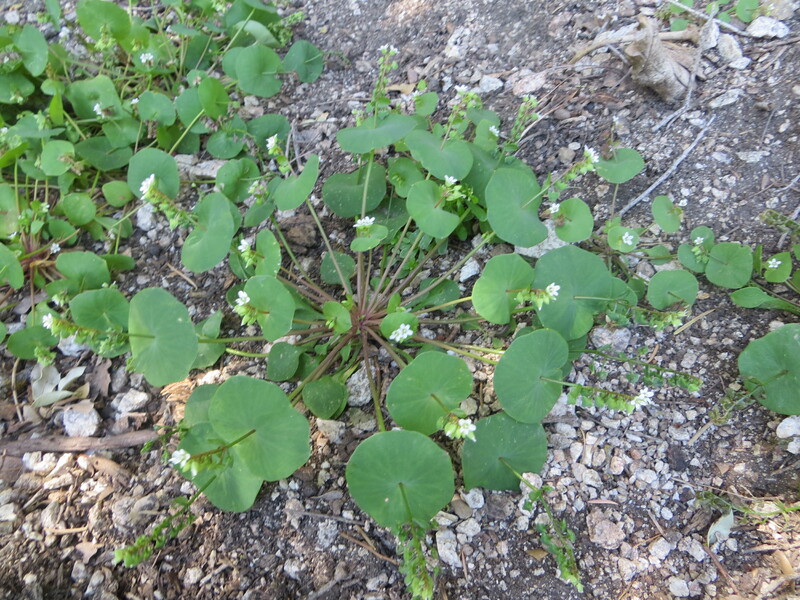 Plants love exceptions WAY MORE than rules: in this particular case there appears to be an environmental element to variation in Claytonia betalain pigmentation, as evidenced by some unpublished observations I have made in common garden experiments involving C. perfoliata, C. rubra, and some perennials in the C. “peirsonii” complex. 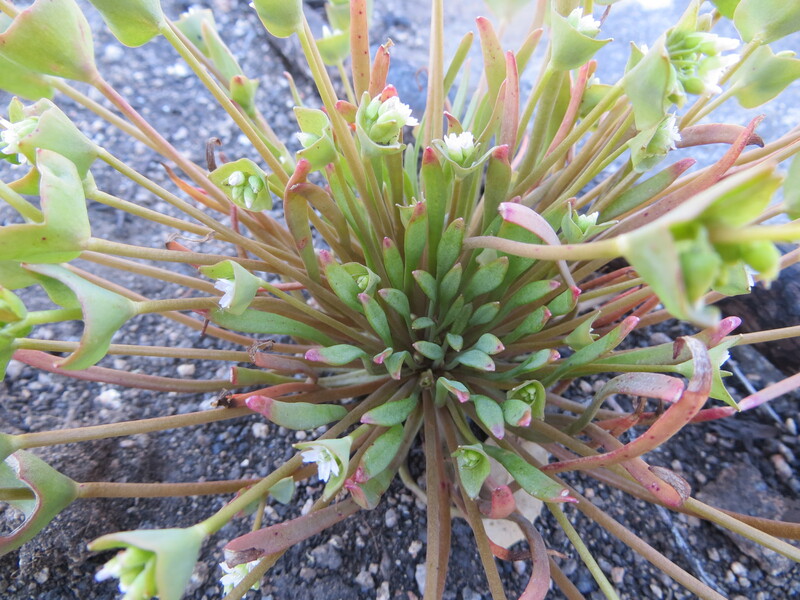 Variegation on foliage characteristic of some lineages of Claytonia rubra. 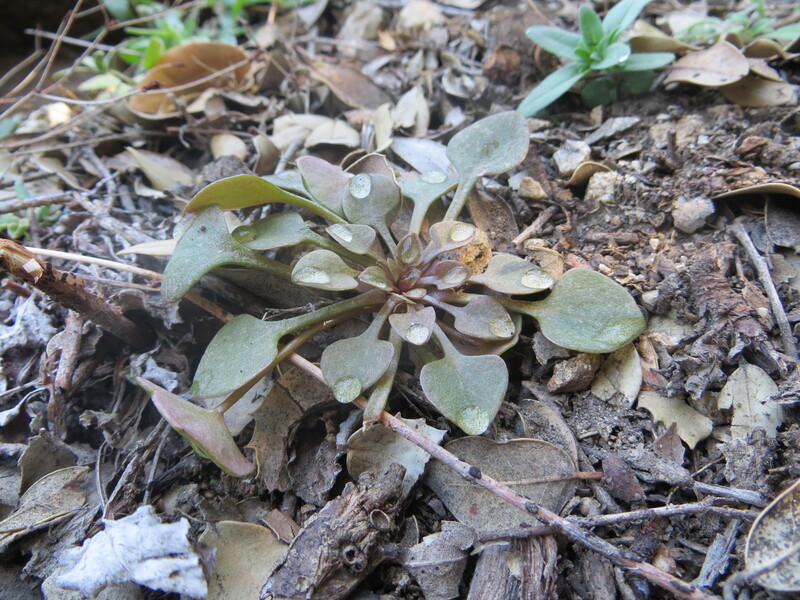 OK, so the leaves are sort of laying flat, and kinda red undeneath, but you’re still not totally convinced you are looking at Claytonia rubra and not some other similar-looking miner’s lettuce. 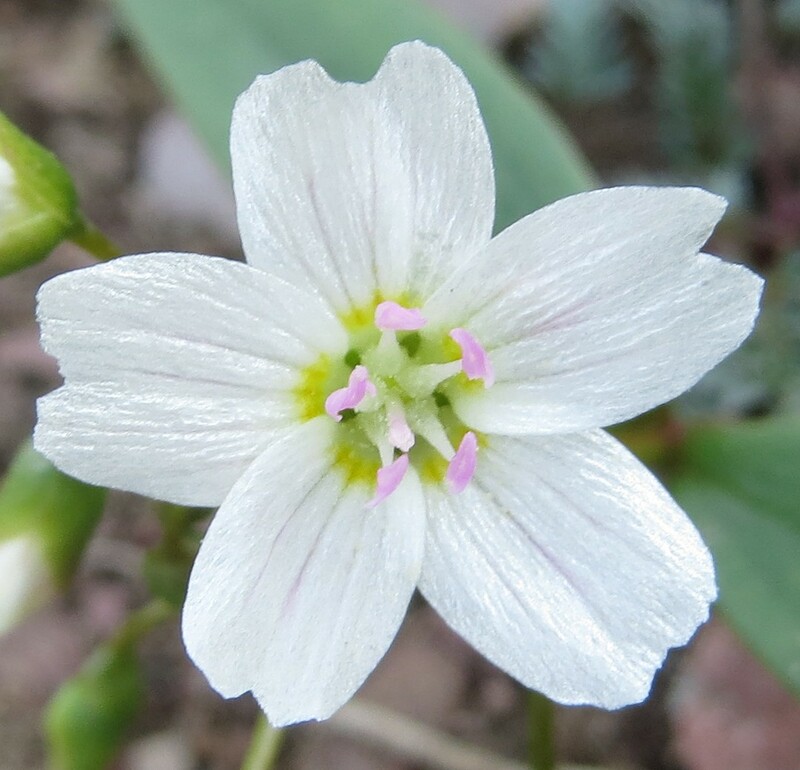 Well, you’re in luck — I’ve noticed that many races of Claytonia rubra tend to have the look of variegated leaves, possibly related to a breaking up of the cuticle during development. 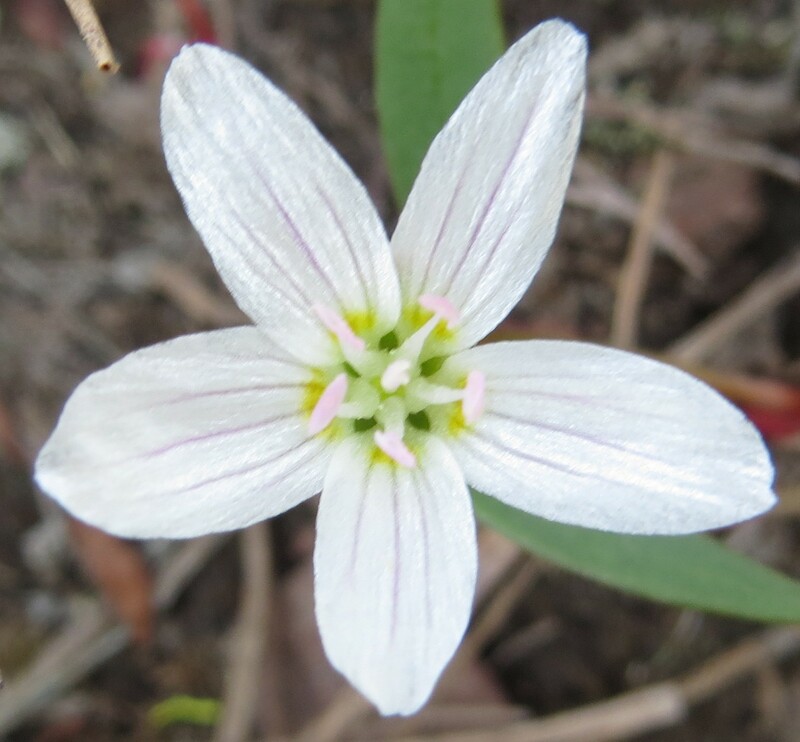 If you see something like the plant in the picture(s) above, where there are variegated streaks on the leaves of a Claytonia, it is VERY likely that you are indeed looking at Claytonia rubra. 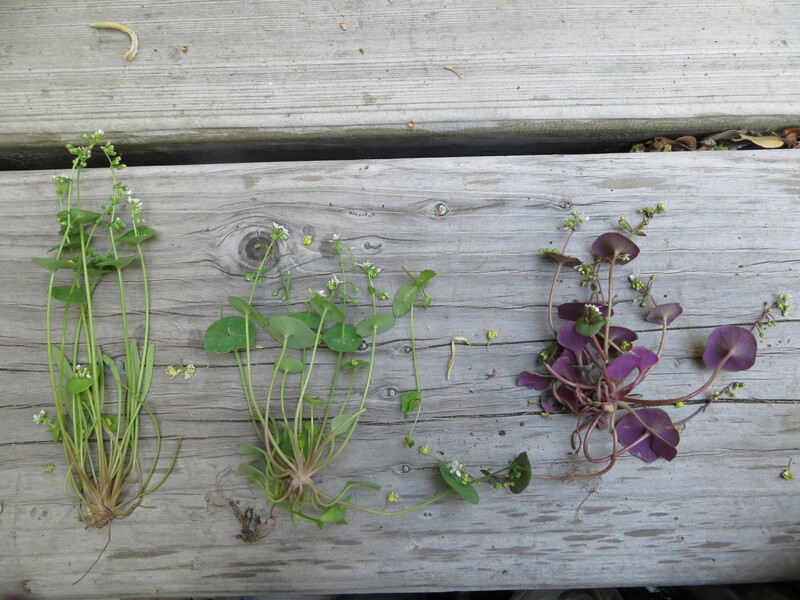 [From left to right, Claytonia parviflora, C. perfoliata, and C. rubra!] 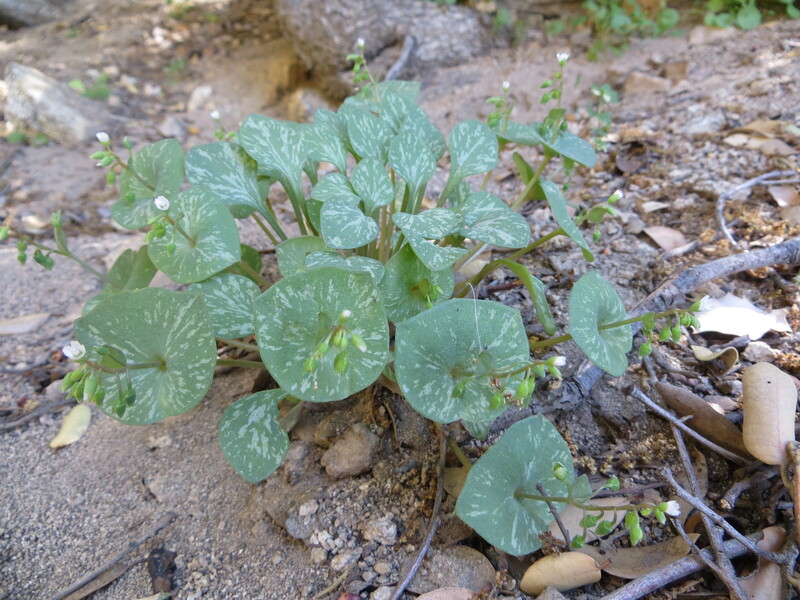 Multiple miner’s lettuce species growing in sympatry in Mill Creek Canyon, San Bernardino Mountains, California. 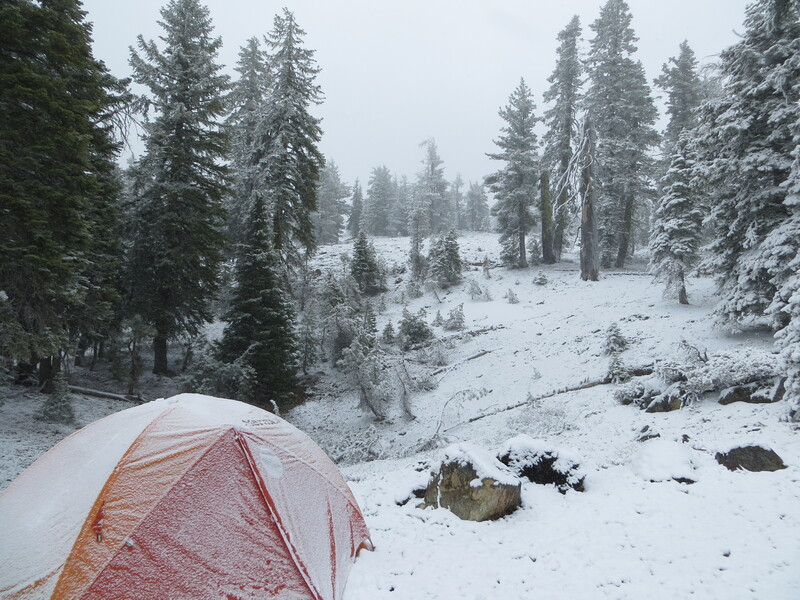 Free data isn’t free… except in this case. 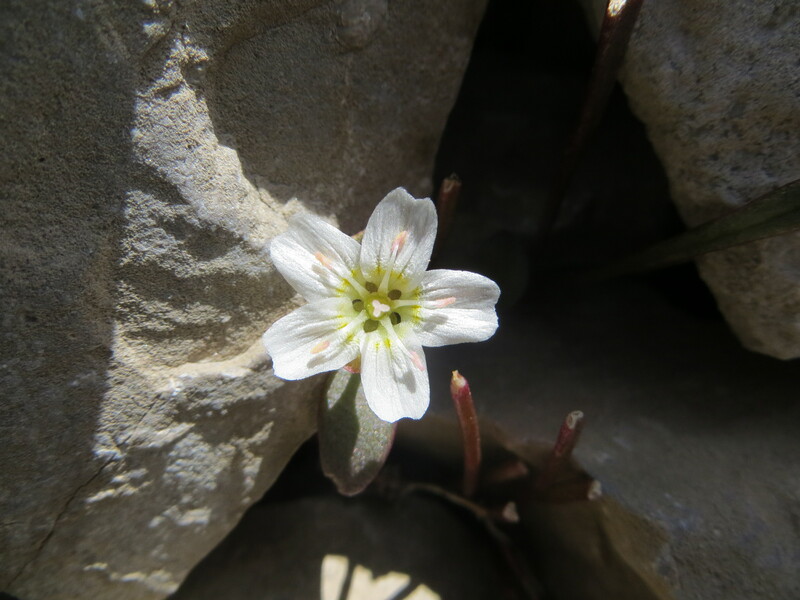 Silene aff. 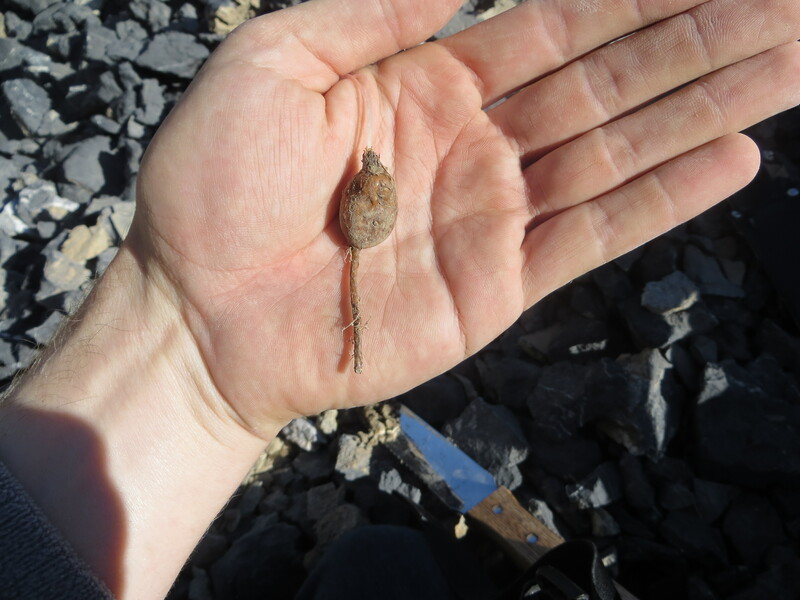 verecunda sp. 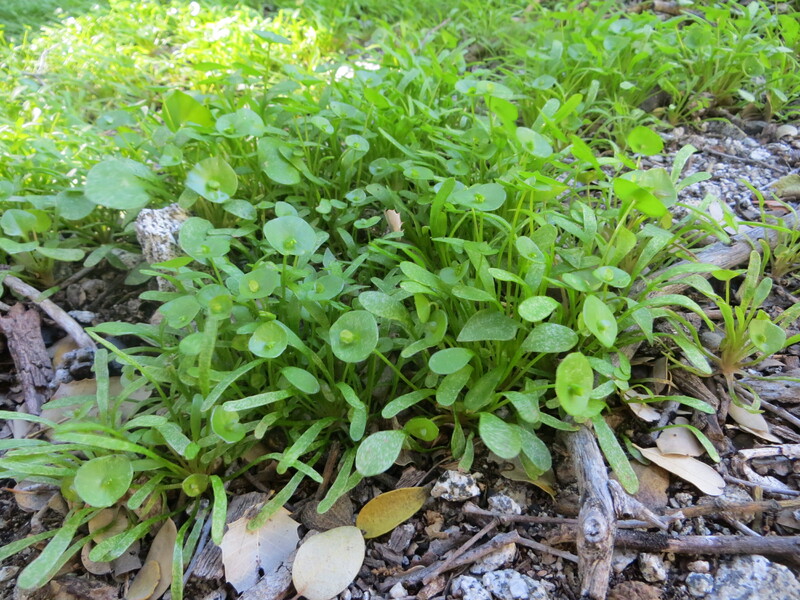 nov. 1 (Caryophyllaceae) — lane 1, lane 2, and lane 3. (combined total = 657,952 reads). Silene aff. 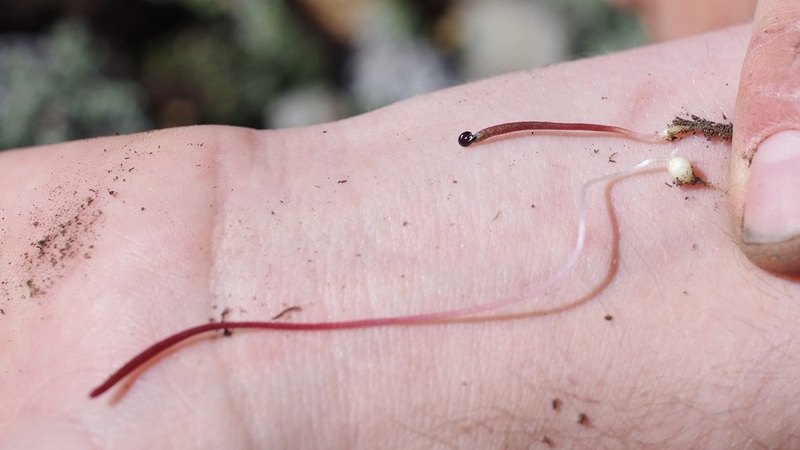 verecunda sp. 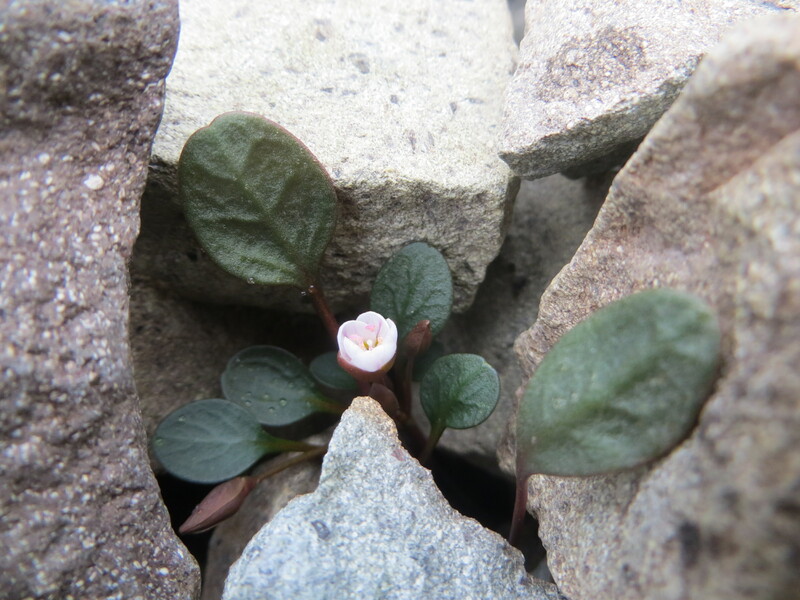 nov. 2 (Caryophyllaceae) — lane 1, lane 2, and lane 3. (combined total = 1,450,085 reads). 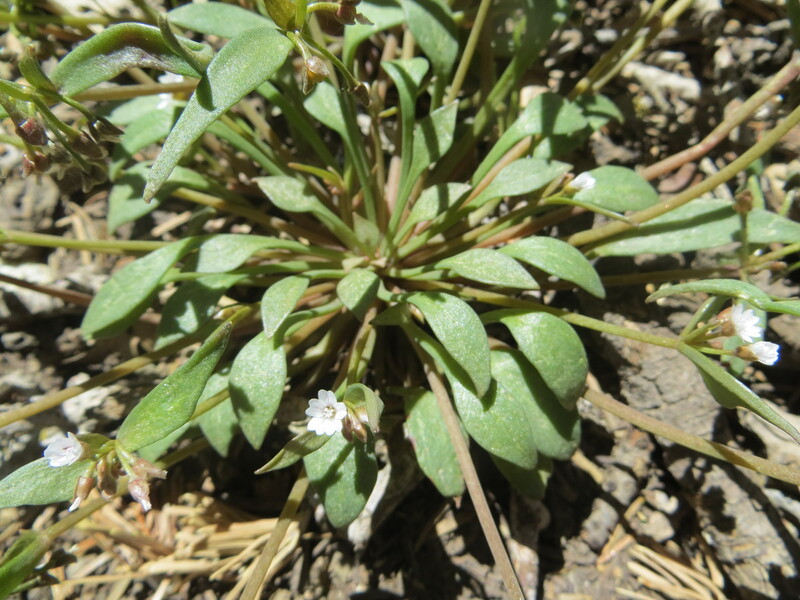 Silene parishii (Caryophyllaceae) — lane 1, lane 2, and lane 3. (combined total = 2,758,351 reads). 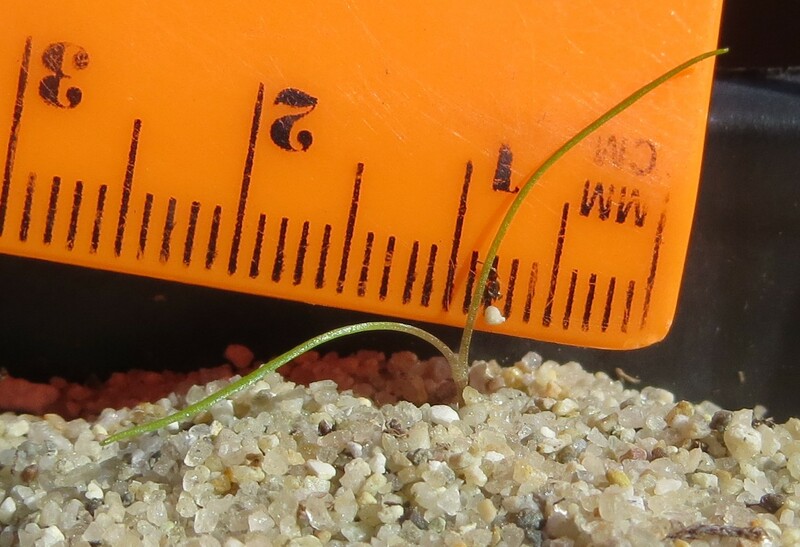 Calandrinia ciliata (Montiaceae) — lane 1, lane 2, and lane 3. (combined total = 1,692,880 reads). 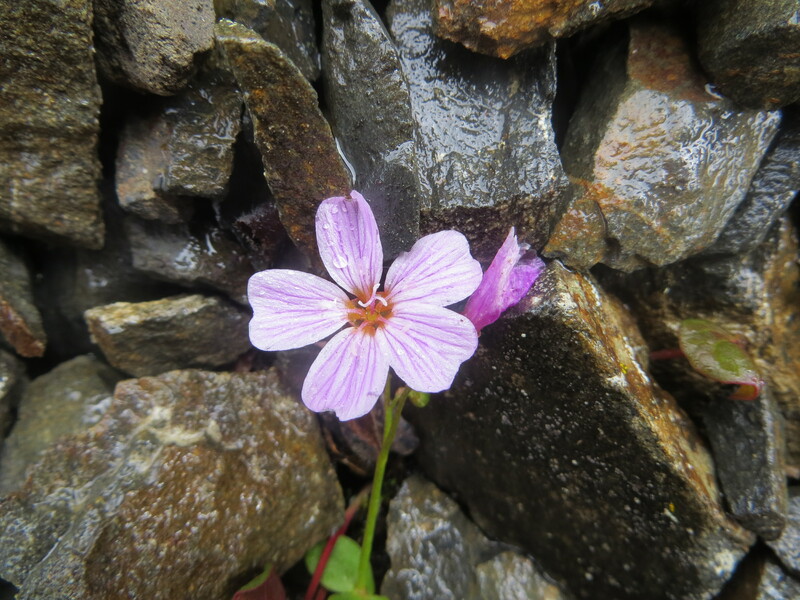 Lewisia rediviva (Montiaceae) — lane 1, lane 2, and lane 3. (combined total = 25,626 reads). 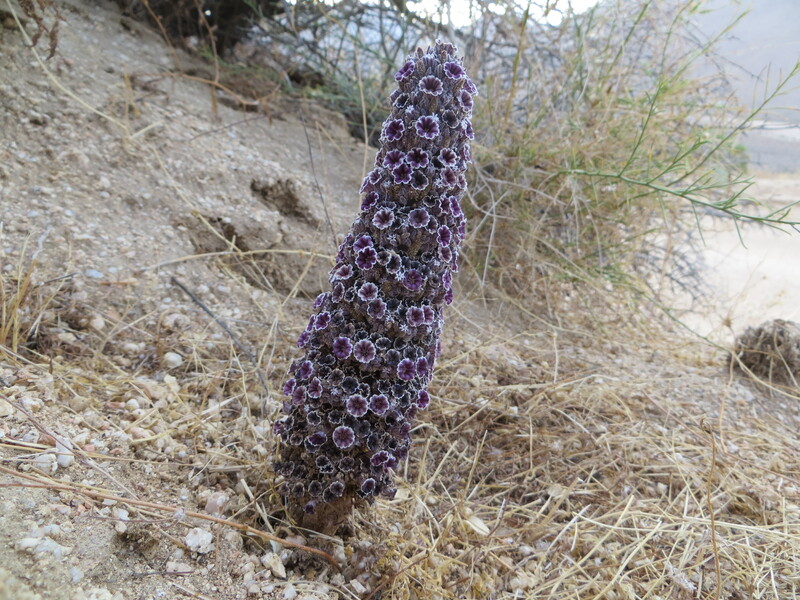 Montia parvifolia (Montiaceae) — lane 1, lane 2, and lane 3. (combined total = 31,848,680 reads). 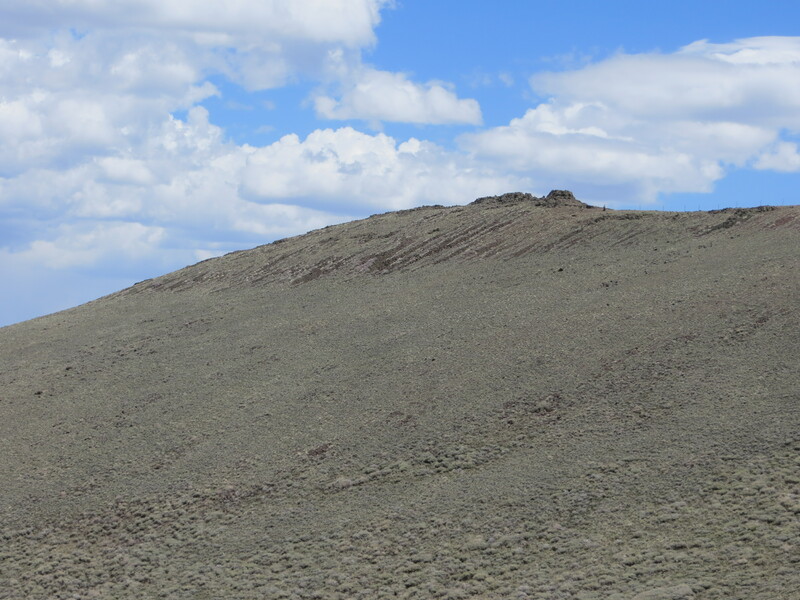 In the (likely) case that I made an error during the copy-and-paste-athon above, feel free to follow this link to a folder containing all of the data. Also, let me know where the copy/paste errors are and I’ll work quickly to fix them! 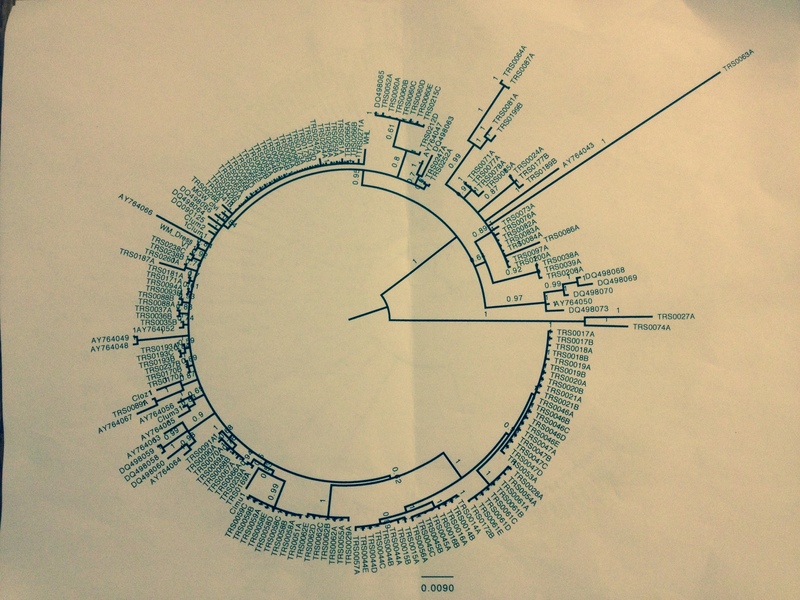 Data details: Genomic DNA was digested using EcoRI and MspI enzymes. Window for size selection was +/- 150 base pairs. Libraries were sequenced on an Illumina HiSeq. Entire dataset includes reads from 2 lanes of single-end (lanes one and two) and 1 lane (lane 3) of paired-end sequencing. These data were generated by Global Biologics. 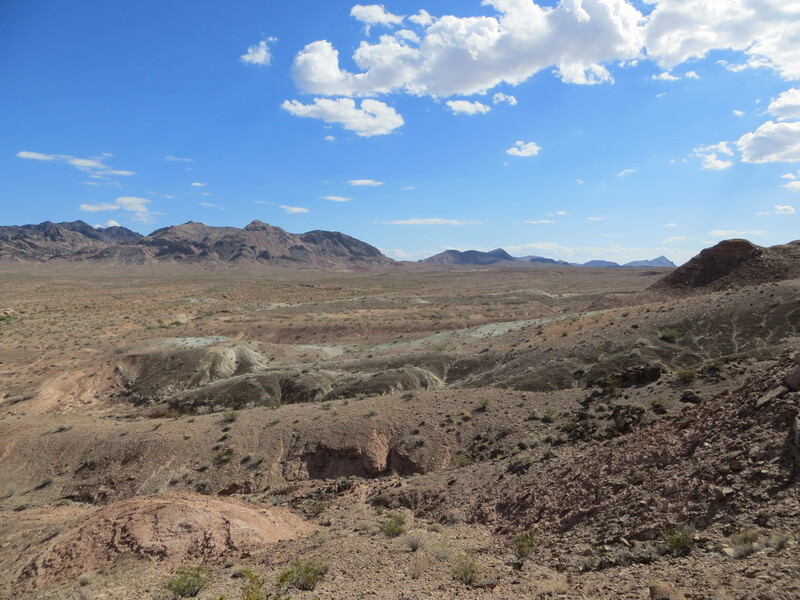 Anything else you want/need to know in order to use these data in a publication, such as voucher information or having the data served in an alternative format, don’t hesitate to ask! 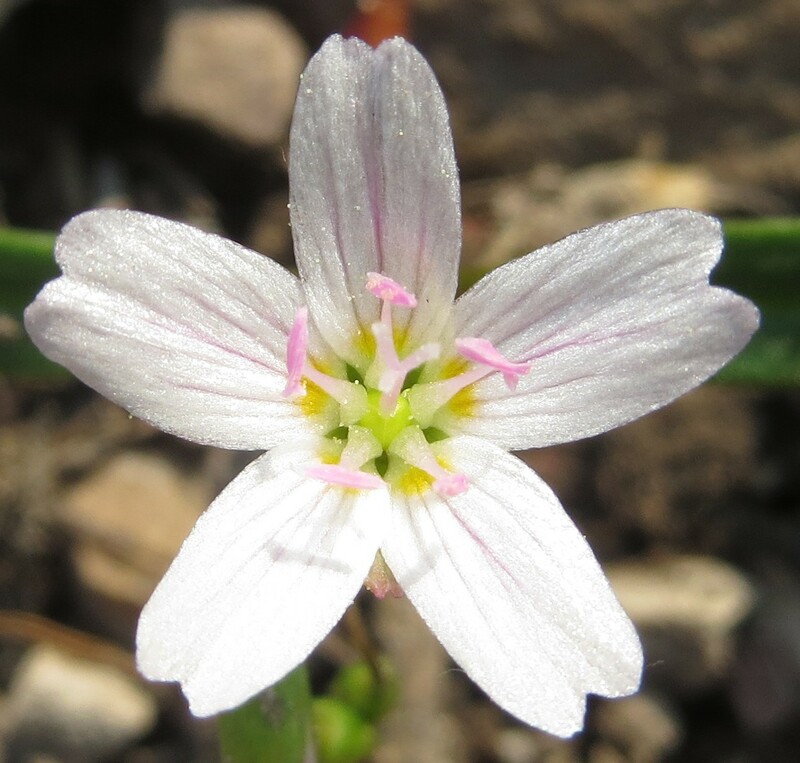 Now before you answer to yourself, consider that the Claytonia in the above two pictures are considered in the current taxonomy to be the same as the plants in the below picture, all being C. lanceolata [for now]. 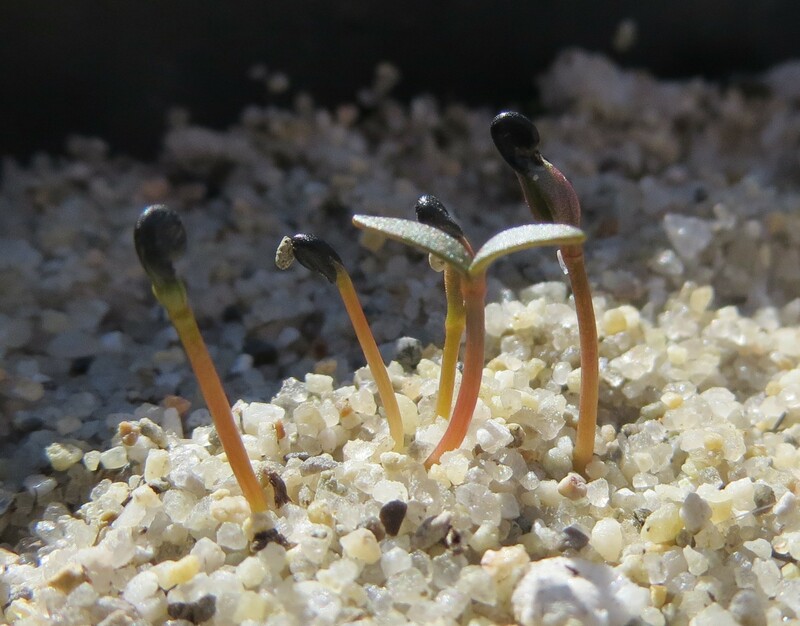 Check out the variation in those leaves!!! 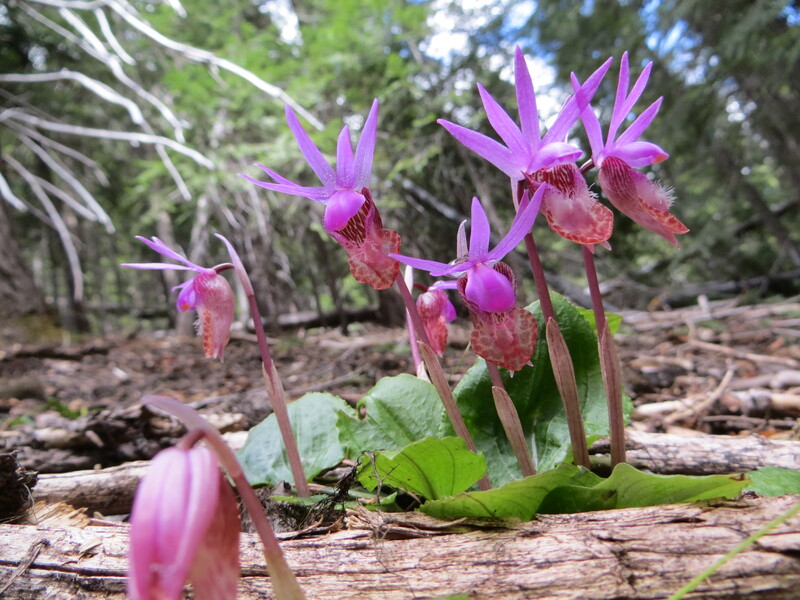 Who cares about the flowers, right? 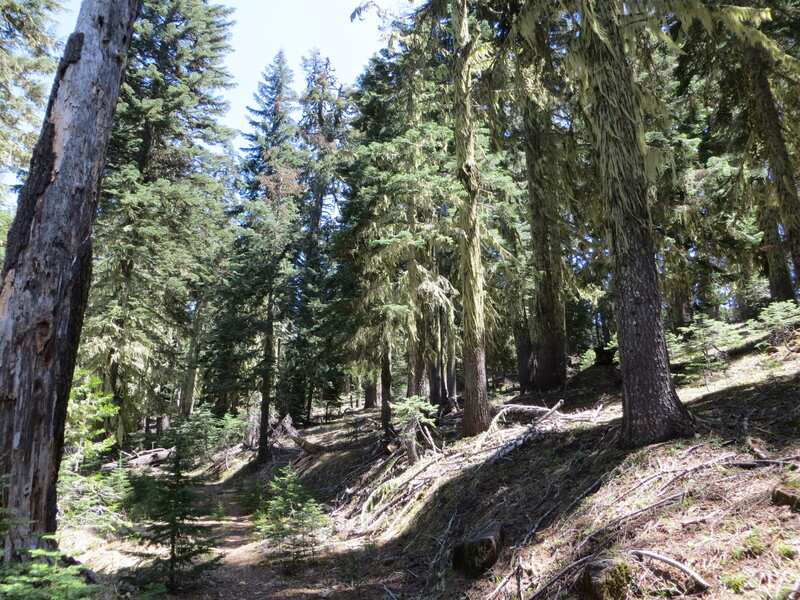 No way… The three photos immediately above correspond respectively with the same three putative taxa [let’s call them operational taxonomic units] in the first three pictures of this blog post. So? SAME or different? Feel free to vote at the bottom, and I welcome any feedback or discussion — I can’t say it all in 140 characters or less. 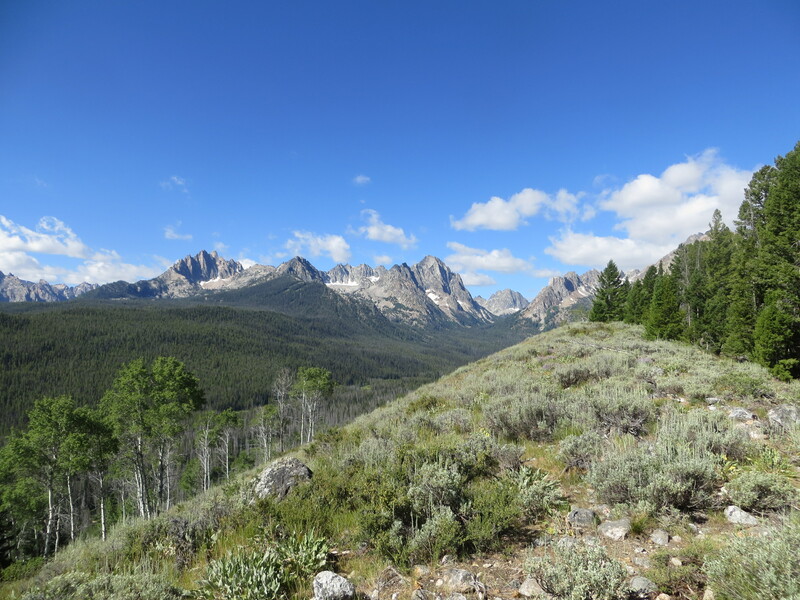 Yukon — too much good stuff! 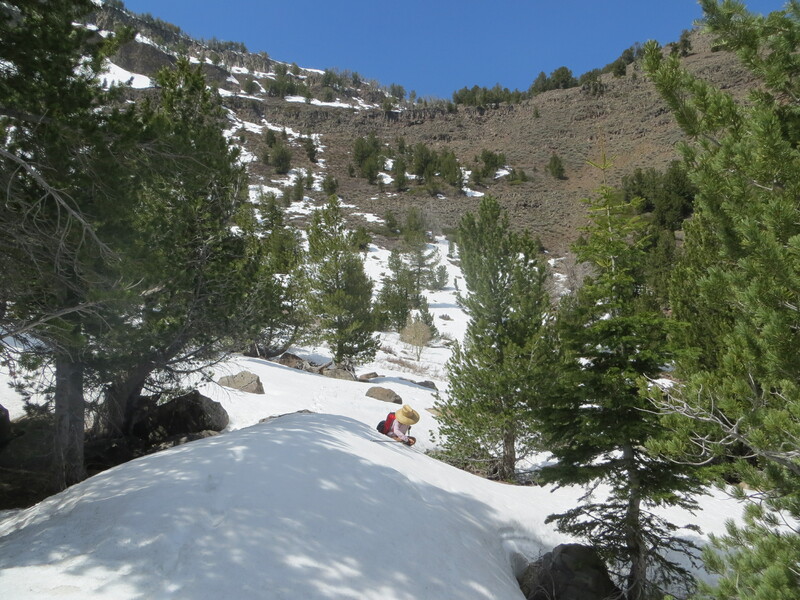 Cheers from the Ogilvie Mountains! So what did I see, exactly? 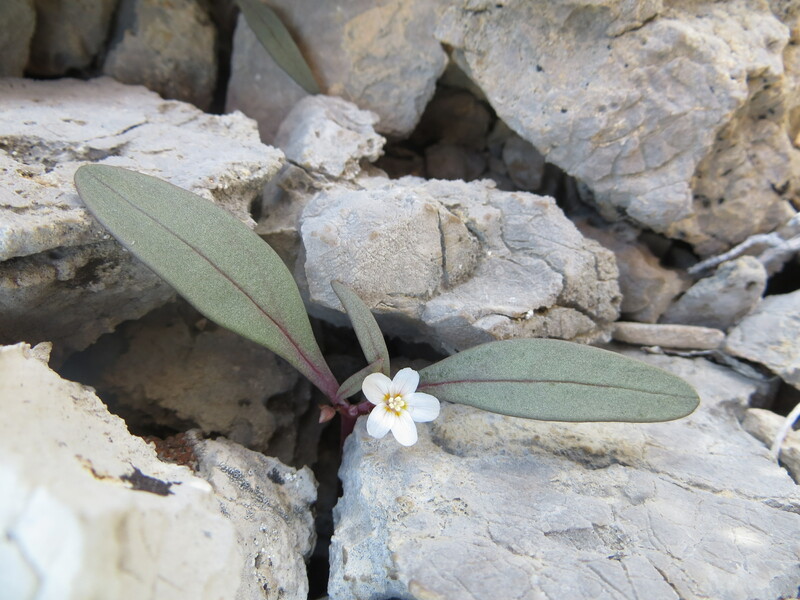 Oh gosh, I collected a fair amount of Silene, a few Androsace septentrionalis seeds and vouchers, at least a few Boechera, and I even grabbed an endemic Claytonia to make the trip VERY worthwhile. 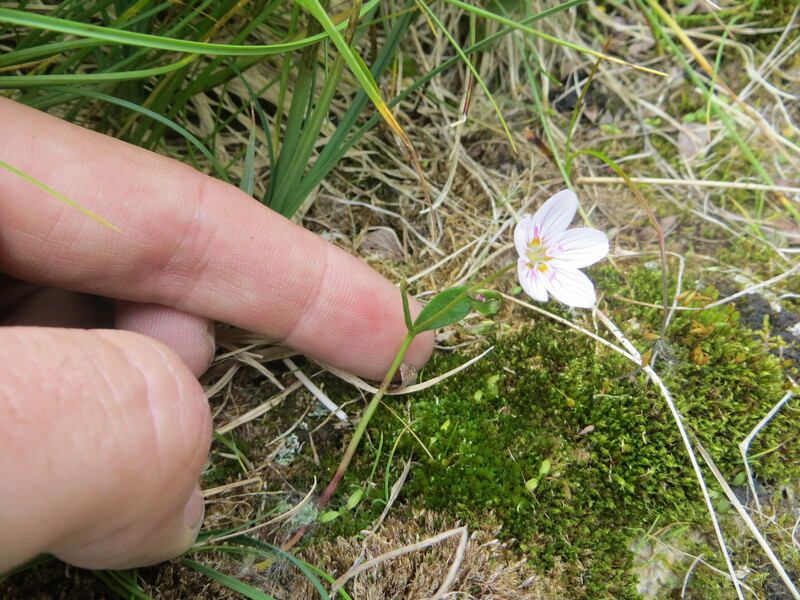 Claytonia ogilviensis (two pictures below) was my main target, so I was very glad that we were able to collect it. 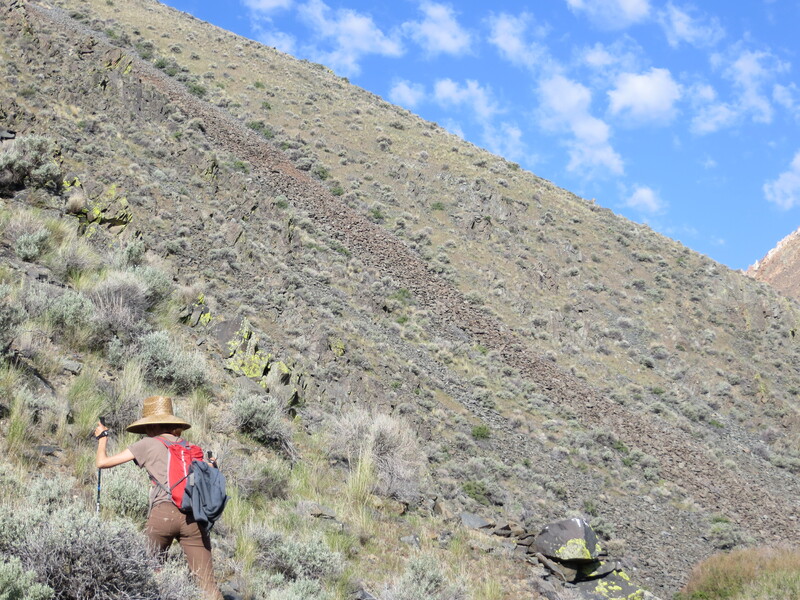 I found at least one population, but I also got the opportunity to sample from some recent herbarium specimens where C. ogilviensis has been collected outside of the range from which it was originally described, each with a slightly different morphology (and geology) to boot — I am VERY excited to see how this all fits into the phylogeny I am developing (with help from collaborators) for Claytonia Section Claytonia. 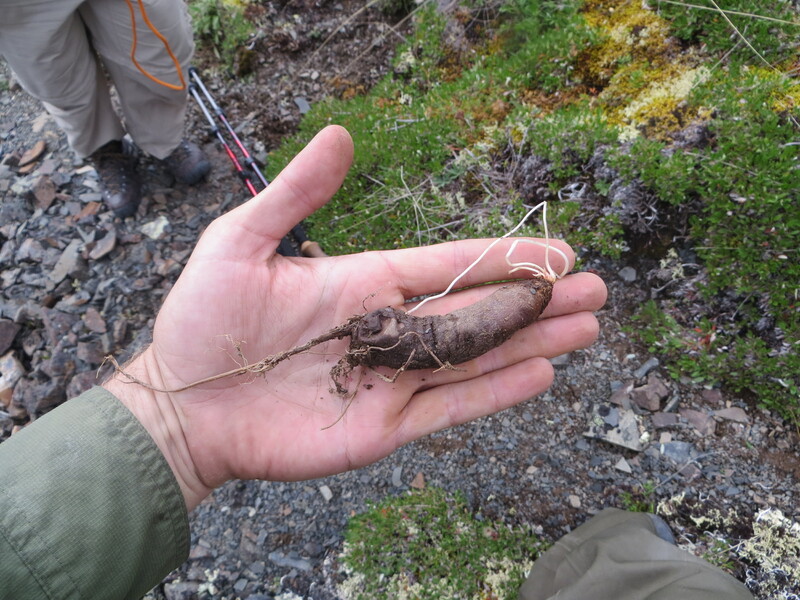 Tuber from putatively old individual of Claytonia ogilviensis in the Ogilvie Mountains, Yukon Territory, Canada. 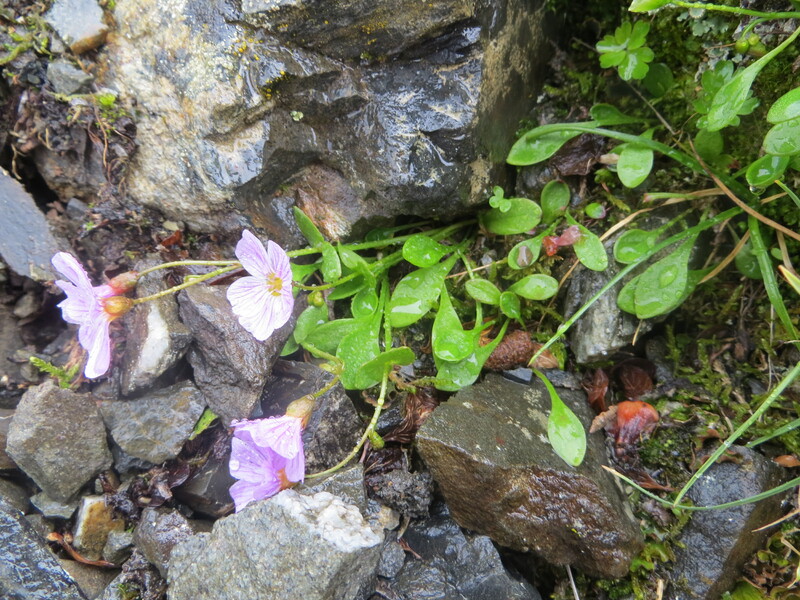 Basal leaf (left center) and remnants of flowering stem (right center) of Claytonia ogilviensis in the Ogilvie Mountains, Yukon Territory, Canada. 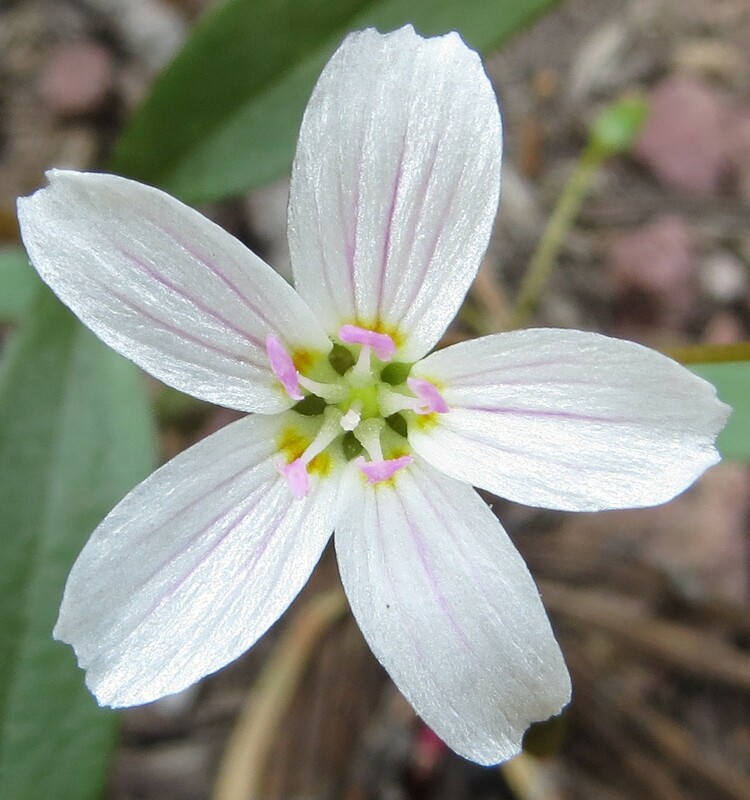 Based on my recent observations in the field, and from scanning herbarium specimens collected all across western North America, I can tell why many people have suggested that Claytonia ogilviensis (pictured above) may be closely related to C. umbellata (pictured below). 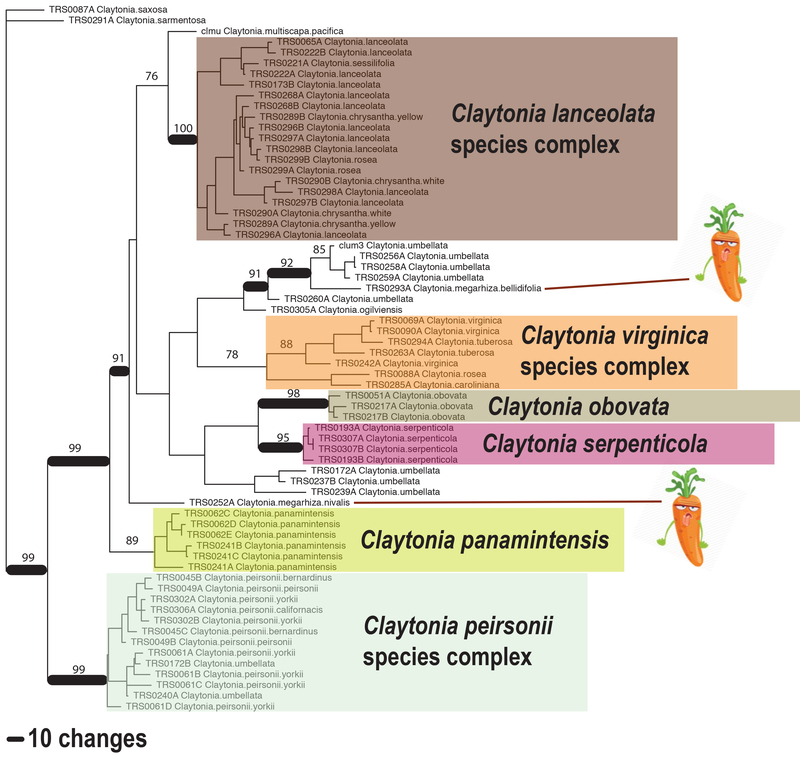 It doesn’t help that I am not EXACTLY sure about who the REAL C. umbellata is, considering I collected four distinct genotypes (each with their own distinct morphologies) all within about 20 air miles of the vaguely described type locality. 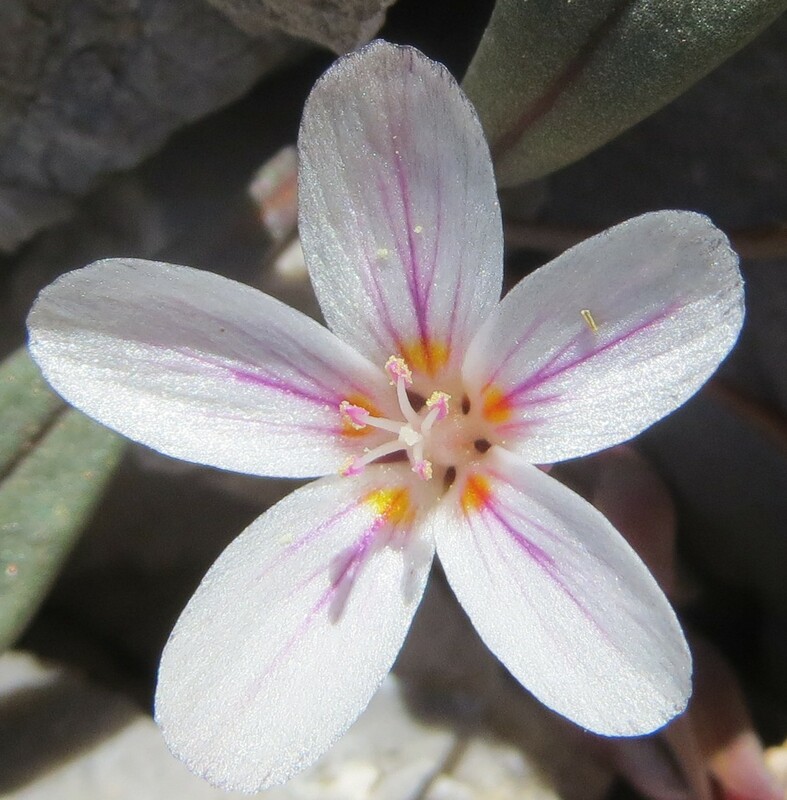 To make matters worse (read about it here), my collaborator has found another distinct lineage of C. umbellata in eastern Oregon that is nearly identical (genetically) to the Ogilvie Mountains endemic (C. ogilviensis) that I just collected… Claytonia is a tough cookie to crack! 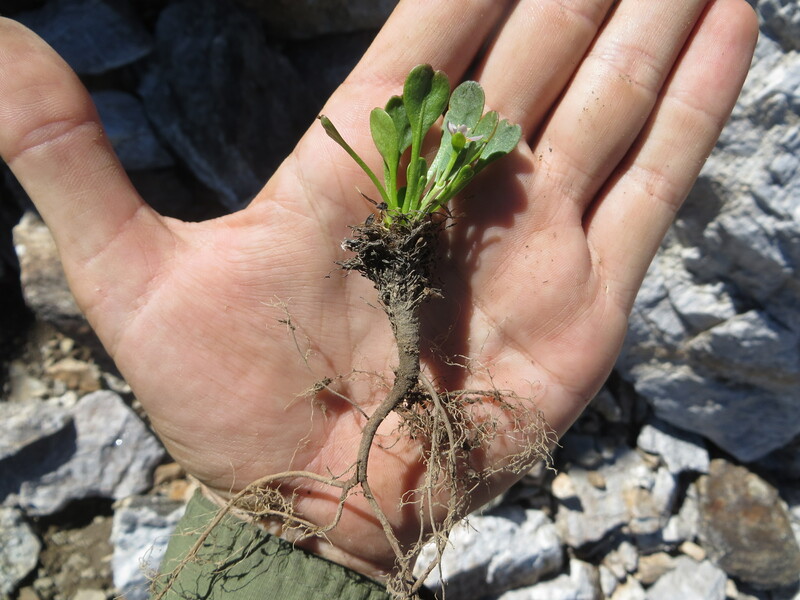 Tuber from individual of Claytonia umbellata in the Diamond Mountains, Nevada. 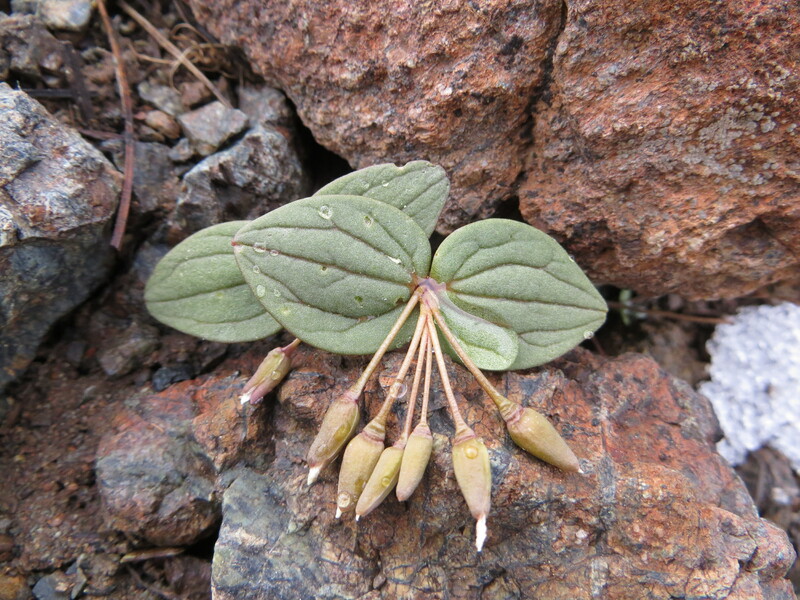 Basal leaf of Claytonia umbellata from the Diamond Mountains, Nevada. 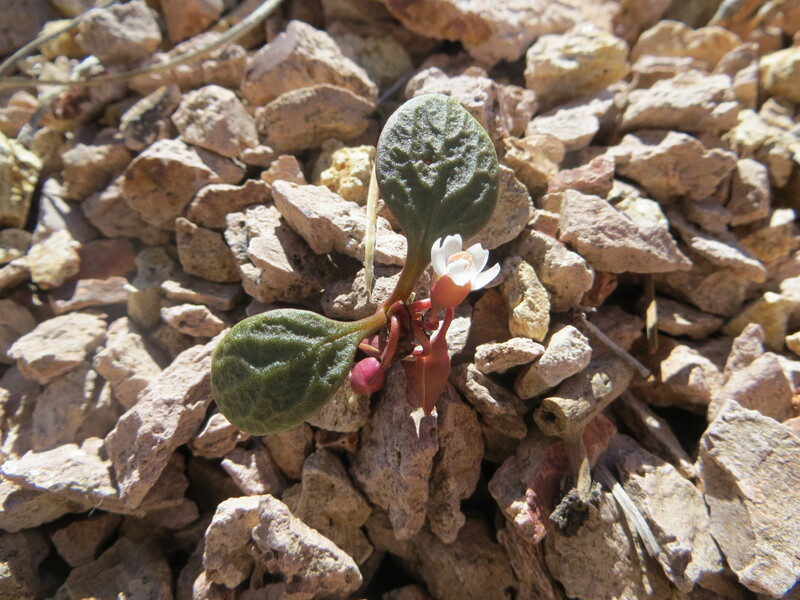 Basal and cauline leaves of Claytonia umbellata from the Pine Nut Mountains, Nevada. 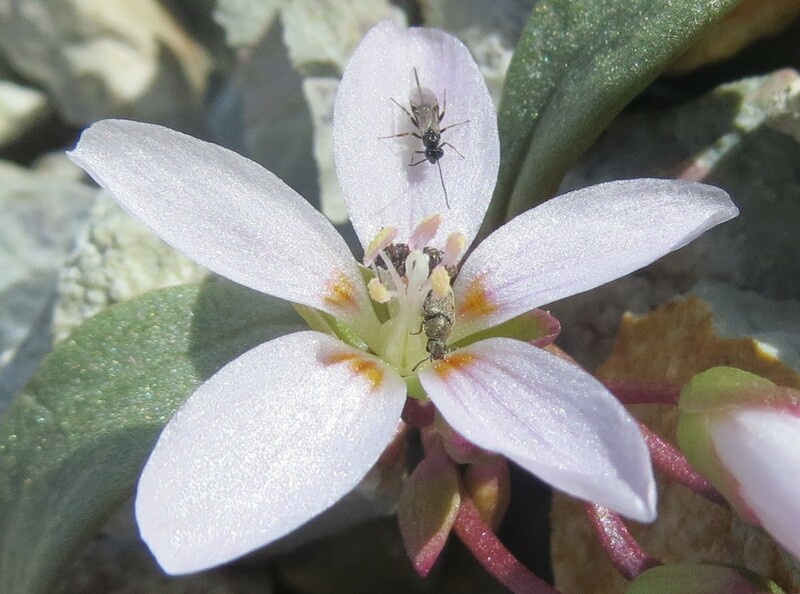 Aside from collecting the narrow endemic Claytonia ogilviensis in the Yukon Territory, I also found an interesting population currently treated as C. tuberosa (pictured below) in the area of Keno Hill. 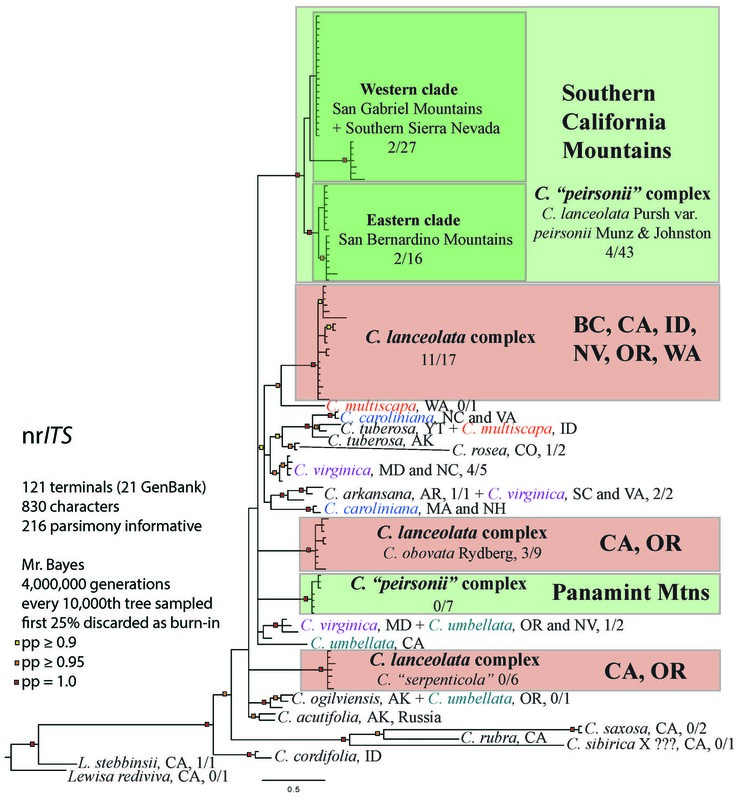 In my most recent nrITS phylogeny, it appears that these plants may be more closely related to samples of C. multiscapa from the Rocky Mountains than they are to other samples of C. tuberosa collected just to the west in Alaska — I don’t yet have chloroplast data to support this relationship (the Idaho area C. multiscapa sequences are from GenBank). 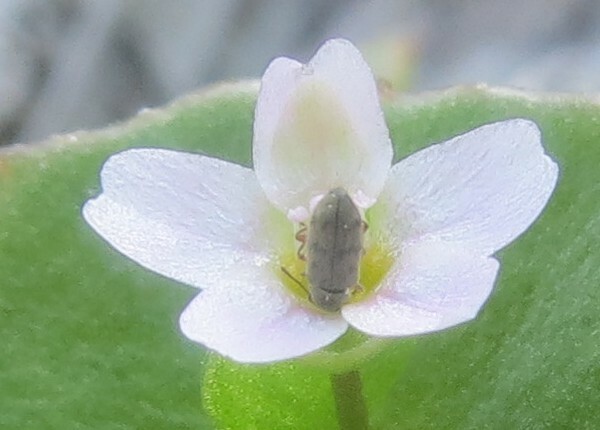 Face-view of flower of Claytonia tuberosa s.l. from the top of Keno Hill, Yukon Territory, Canada. 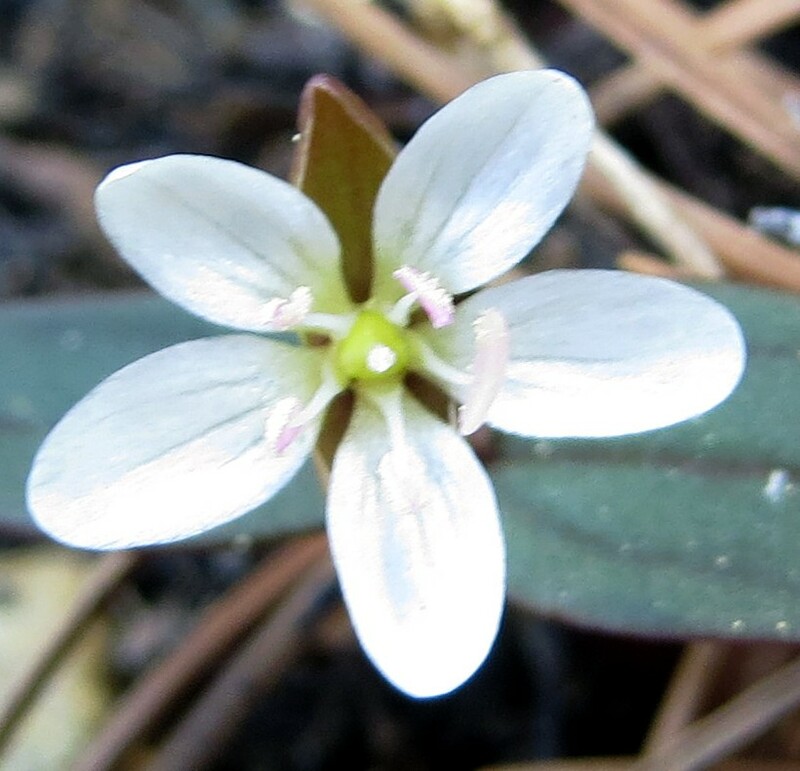 Claytonia tuberosa s.l. 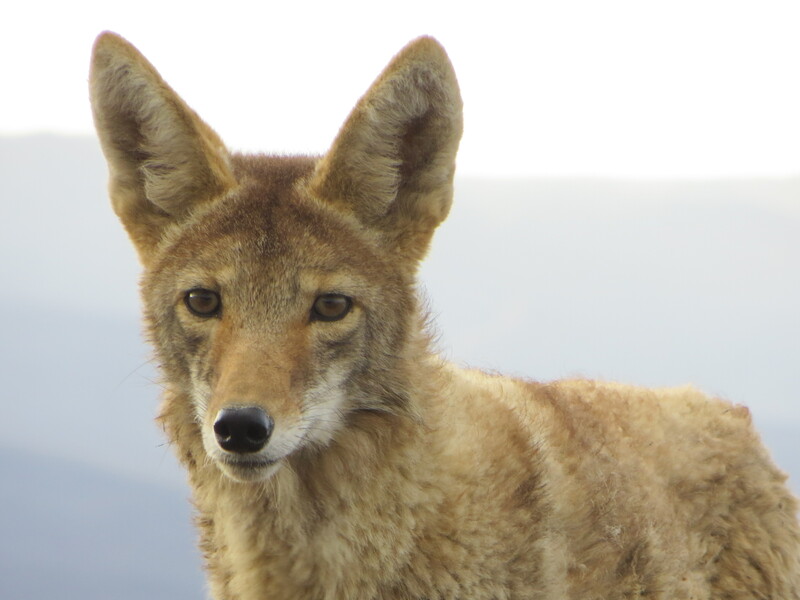 photographed on top of Keno Hill, Yukon Territory, Canada. 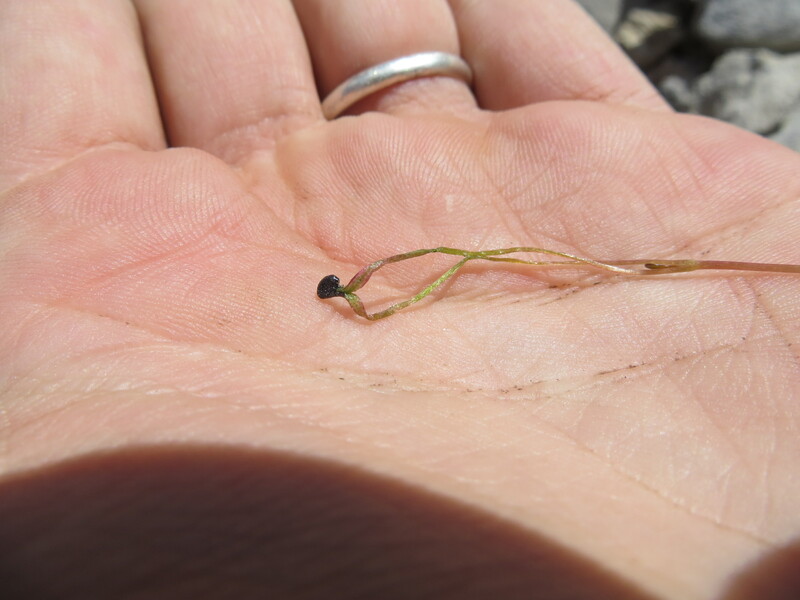 Lastly, I got to see and collect a VERY beautiful Claytonia in the Kluane National Park, a member (and my first sample) of Section Rhizomatosae — Claytonia sarmentosa (photographed below). 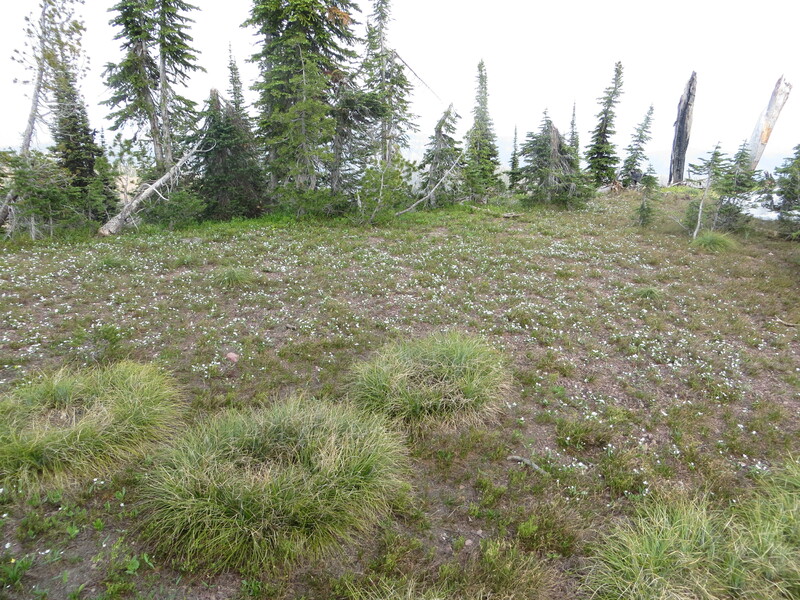 This rhizomatous perennial seems to really prefer talus slopes, not unlike C. ogilviensis, C. umbellata, and the C. “peirsonii” complex. 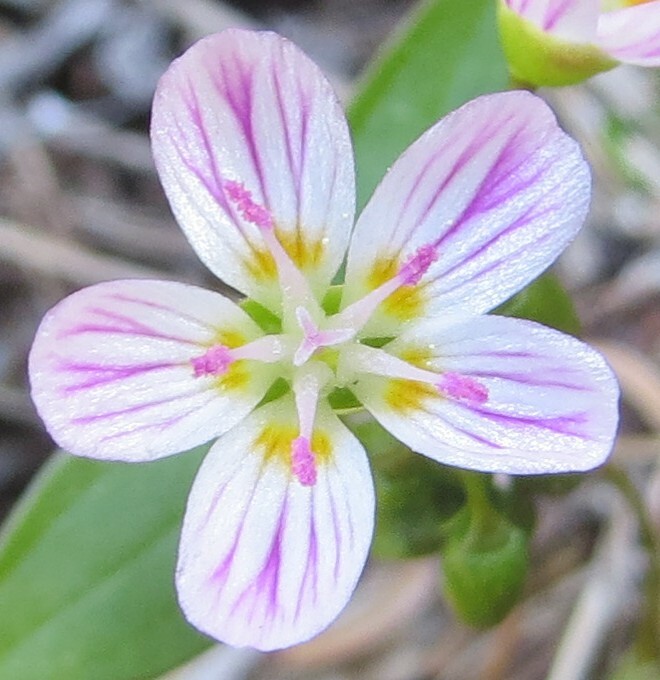 Face-view of flower of Claytonia sarmentosa from the Kluane Ranges, Yukon Territory, Canada. 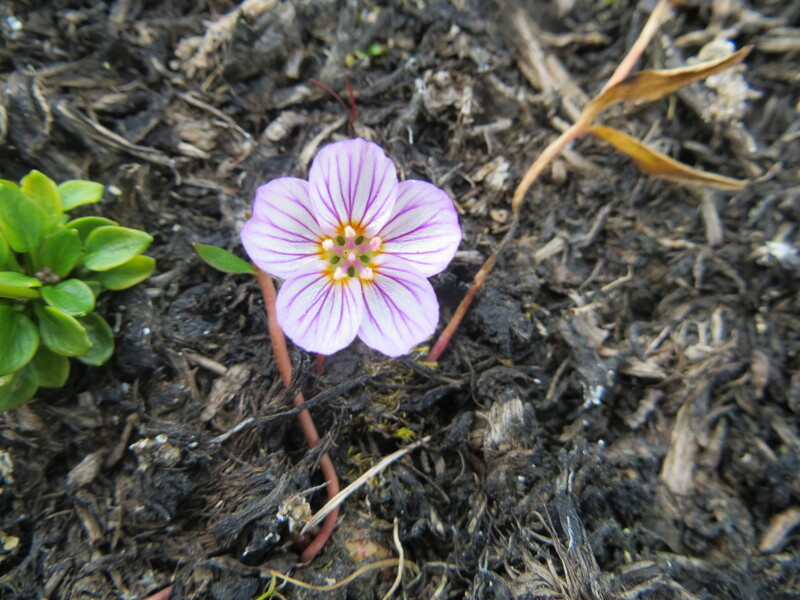 Claytonia sarmentosa photographed on the King’s Throne Trail, Kluane Ranges, Yukon Territory, Canada. 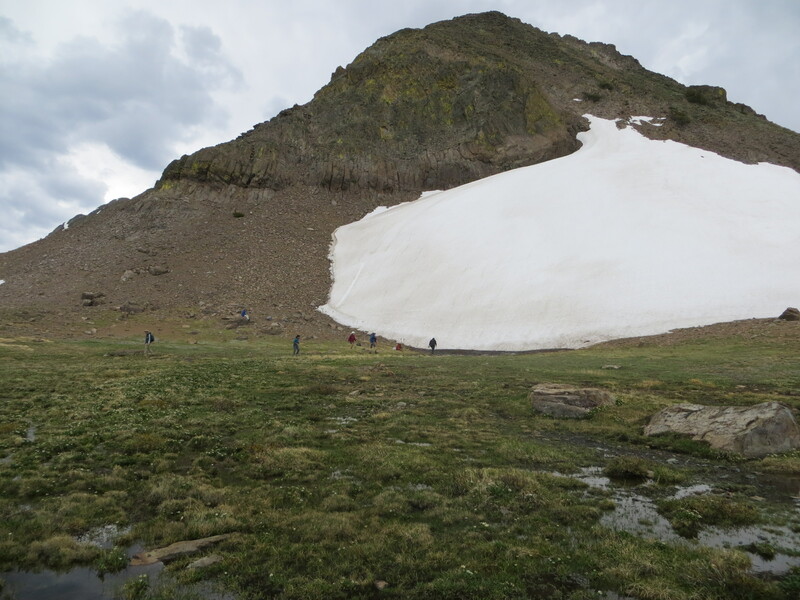 It was a great trip, but I’m glad to be home — with school about to start, and another spring season just around the corner, it is time to REALLY get some work done!!! 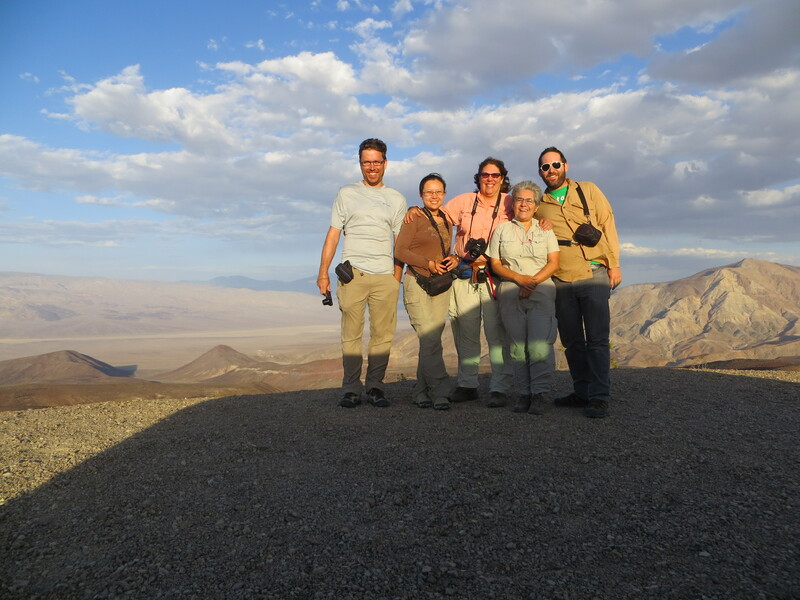 Up Next = Molecular lab + Herbarium work.